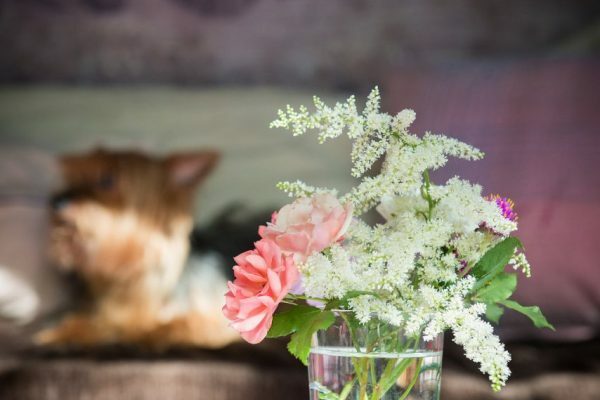 When the frigid winter air makes way for the first unfurling leaves of spring, all living beings flock to bask in the sunshine and breathe deeply the fragrances that lay dormant under the cold, protective earth. 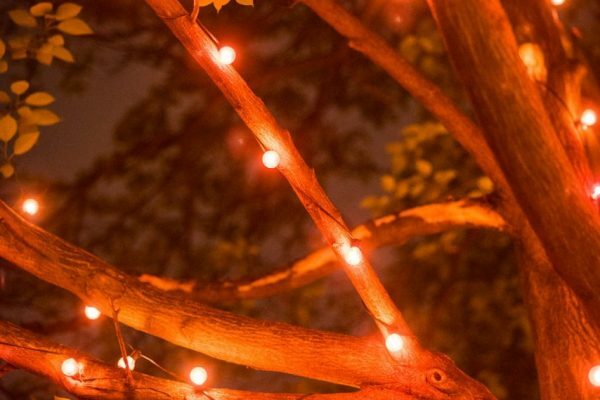 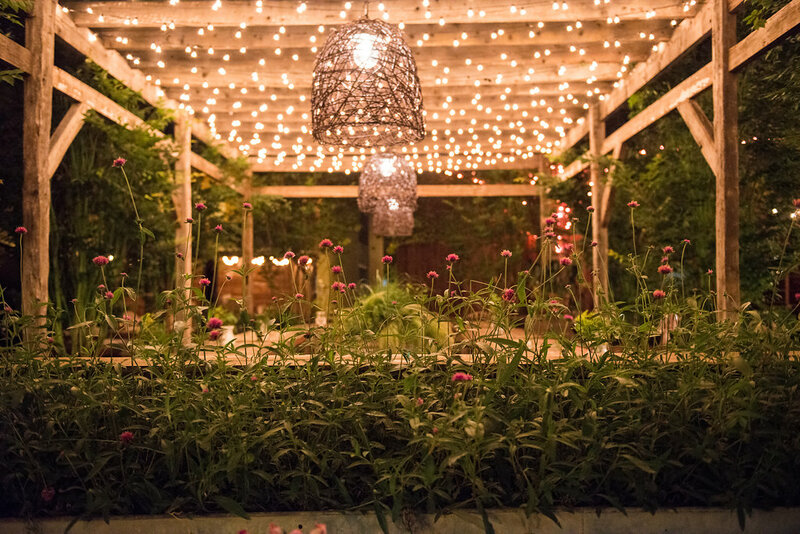 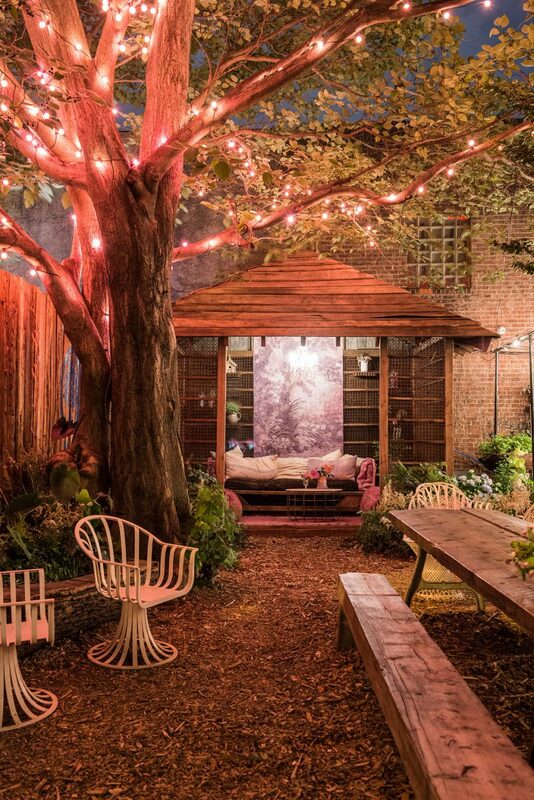 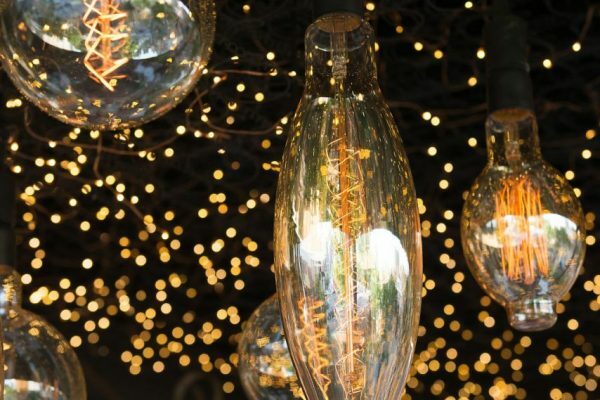 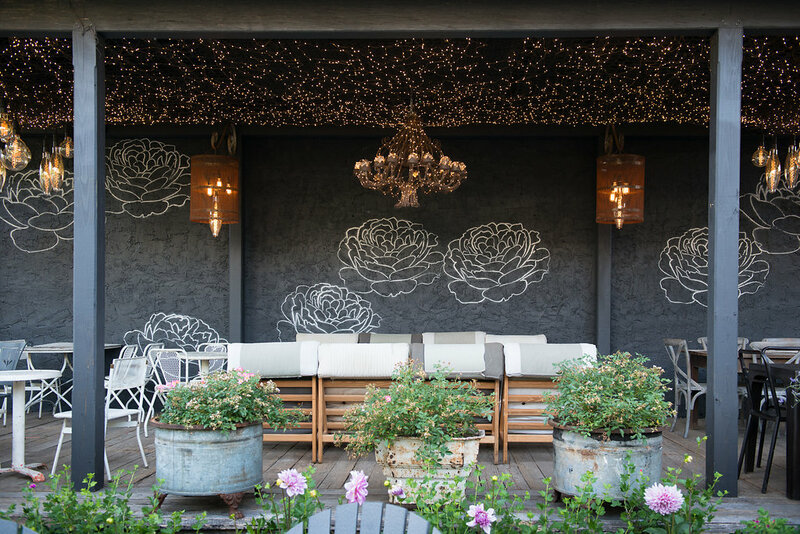 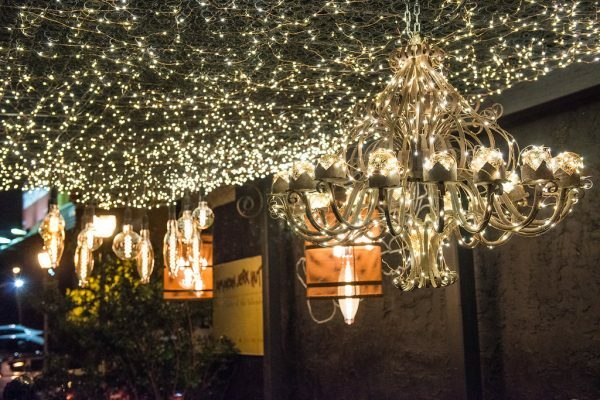 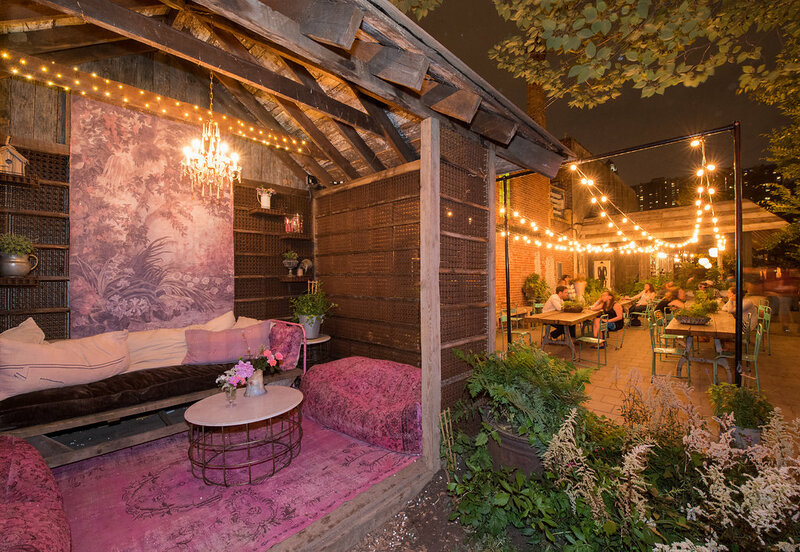 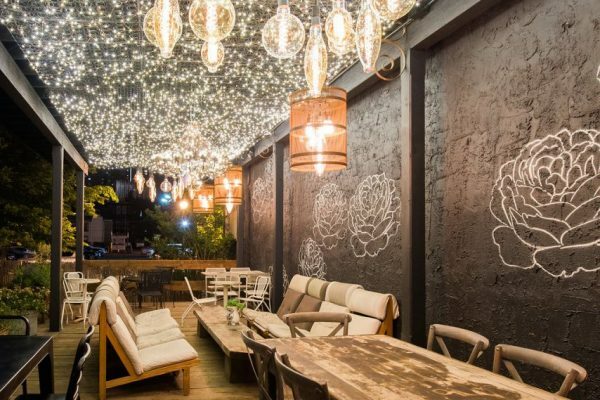 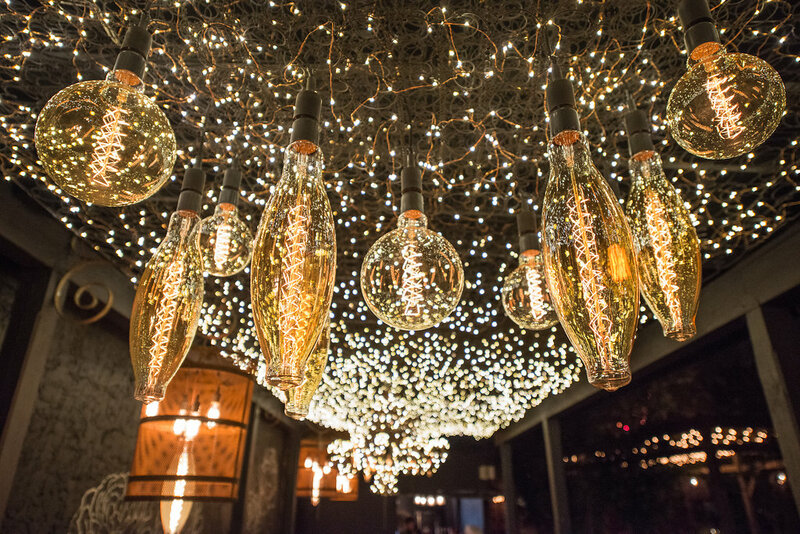 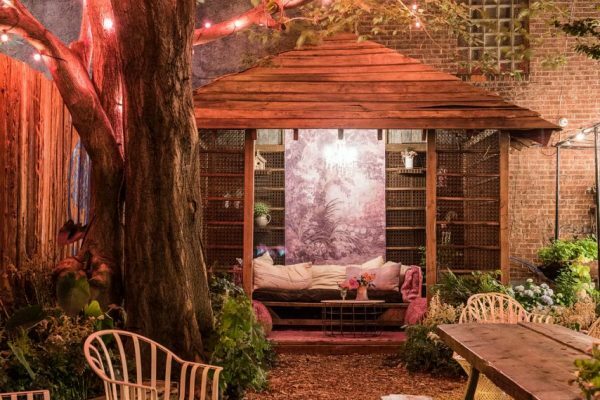 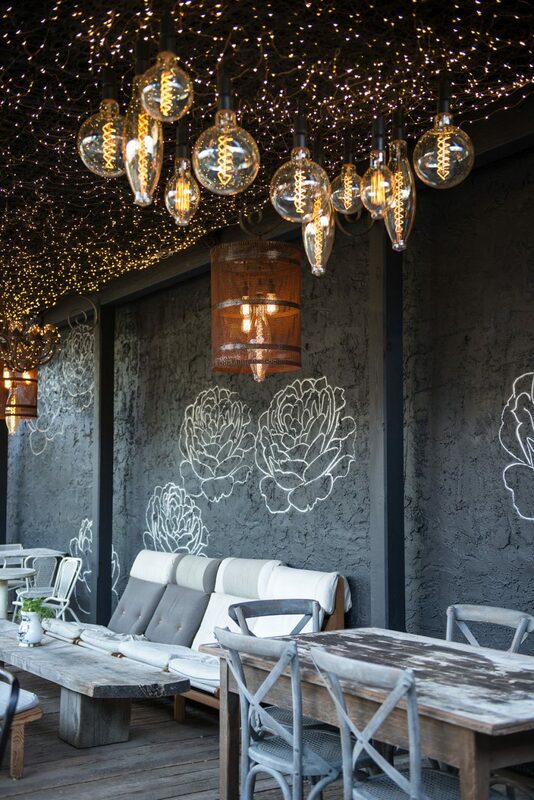 A summer night filled with twinkle lights, lounge areas, private cocoons , lush gardens, and delicious food and cocktails makes for an urban retreat worth visiting over and over. 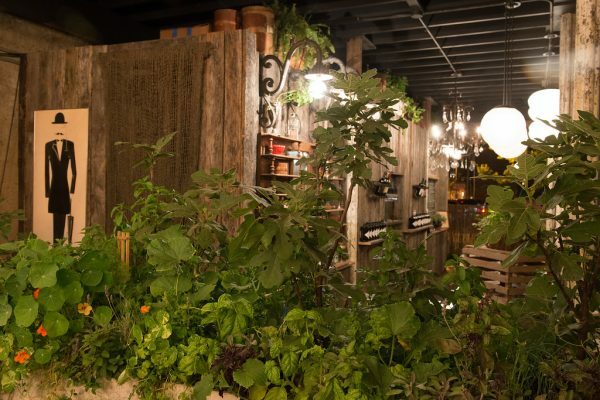 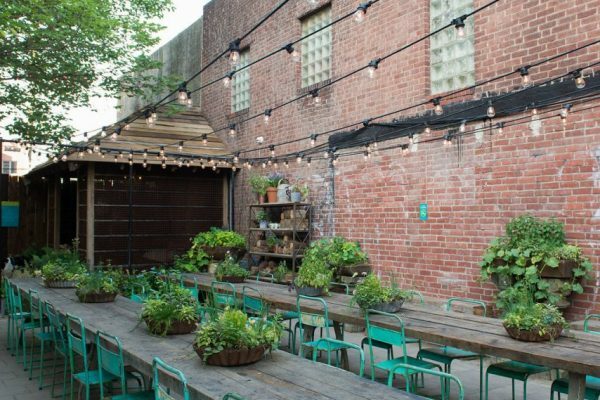 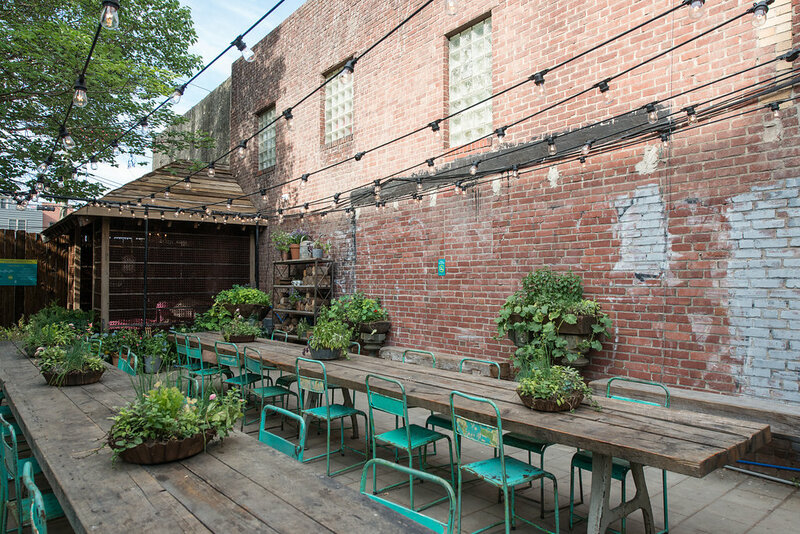 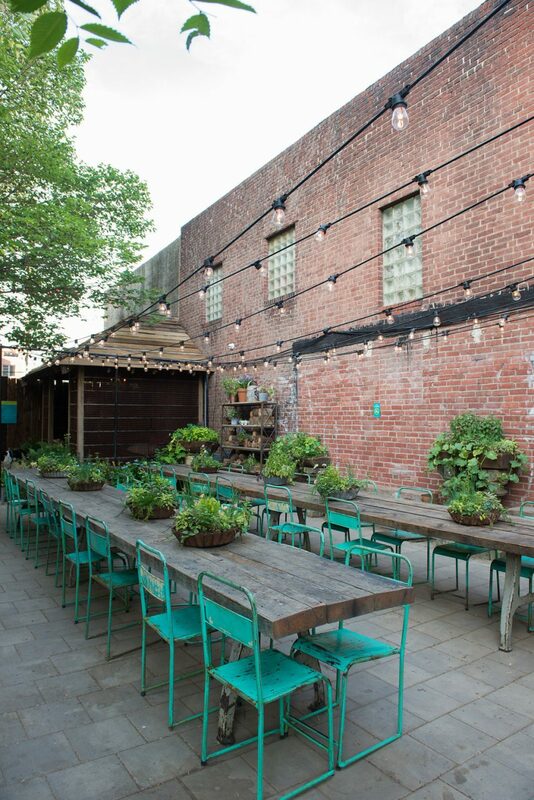 It is my great honor to have designed the PHS South Street Pop Up Garden for the second year. 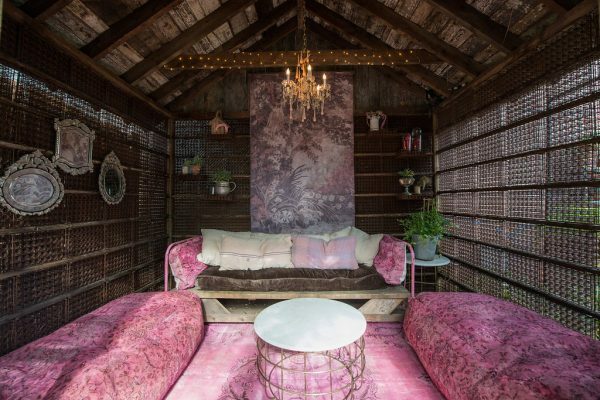 This years Pop Up design is an enhancement of what was started last year. 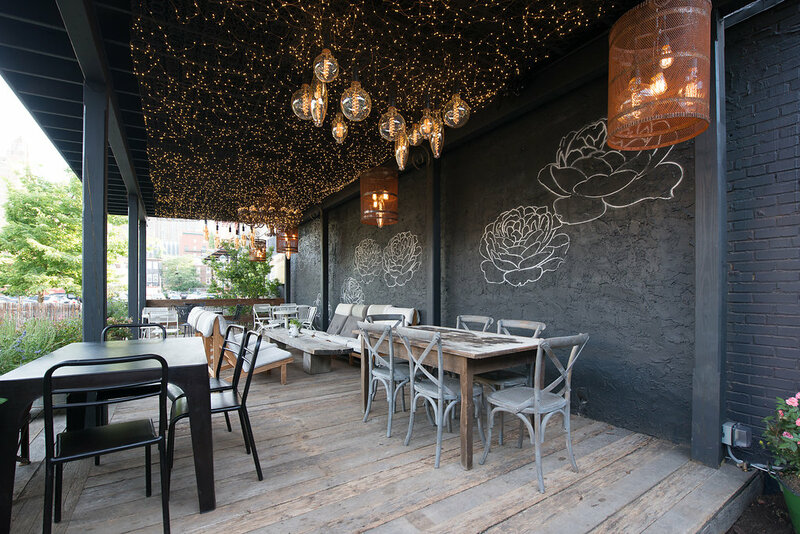 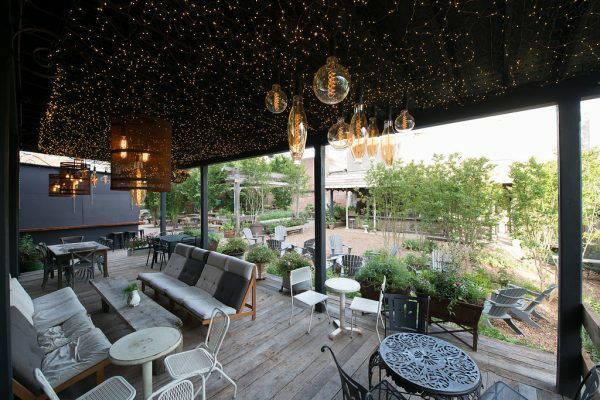 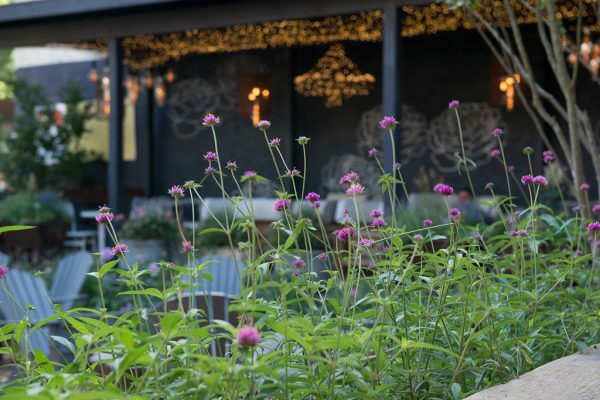 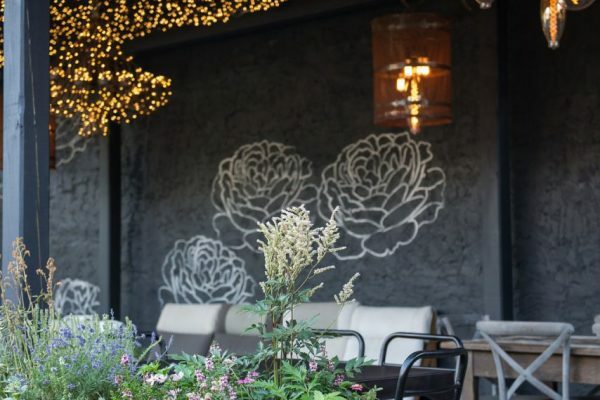 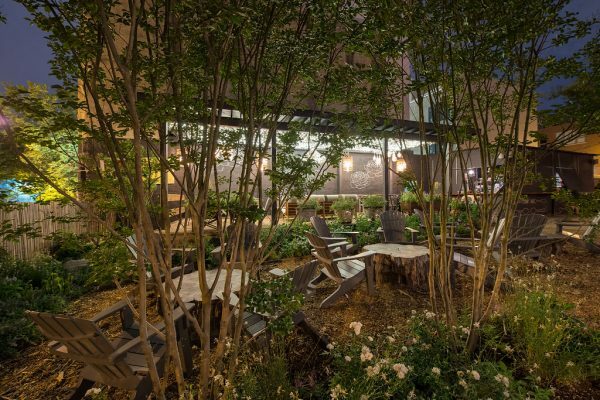 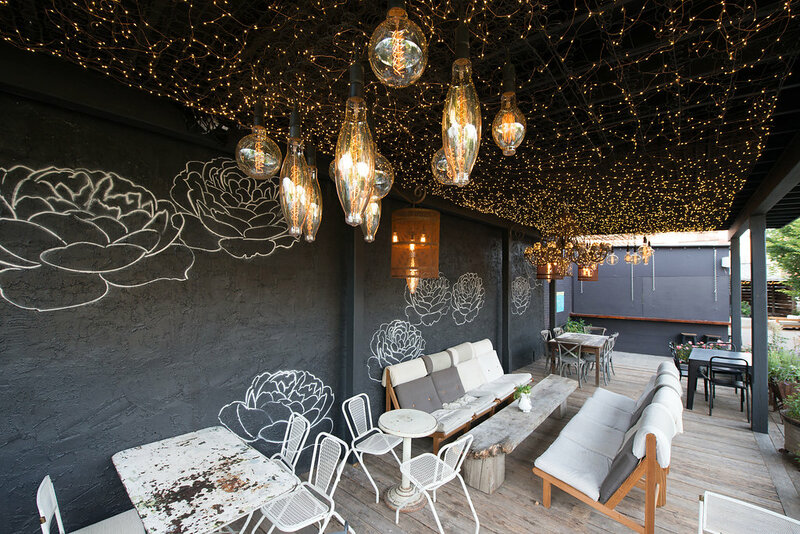 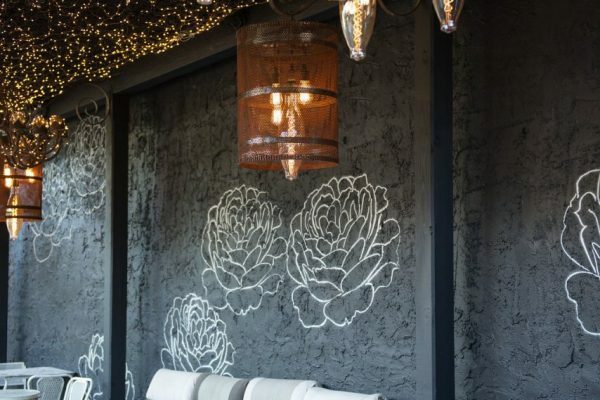 With the luxury of being in the same location, we were able work with some of the much loved components of last years space, but also create new spaces that make it an even more magical oasis in the middle of the city. Visitors will experience a true, lovely garden that will only get better as the season develops. 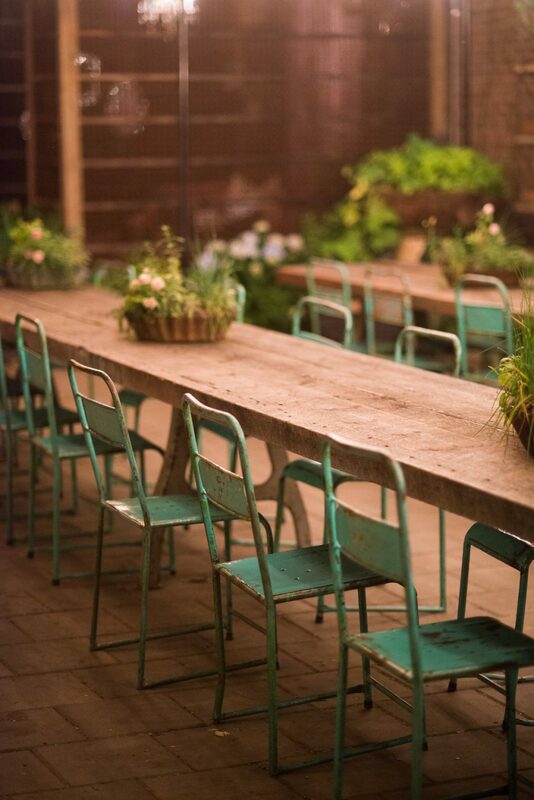 The space planning has been carefully thought out for an optimum visitor experience. The garden is divided in to many separate areas; some private and romantic and some public and social. 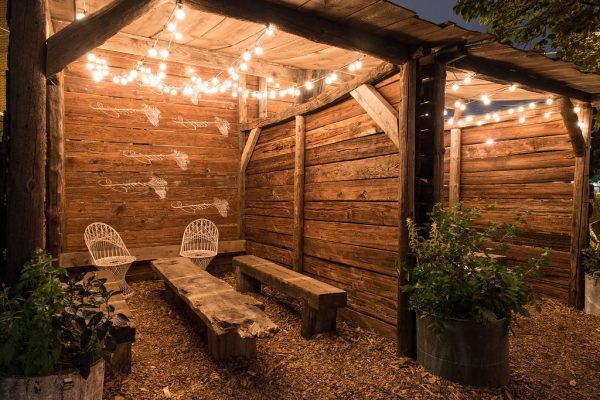 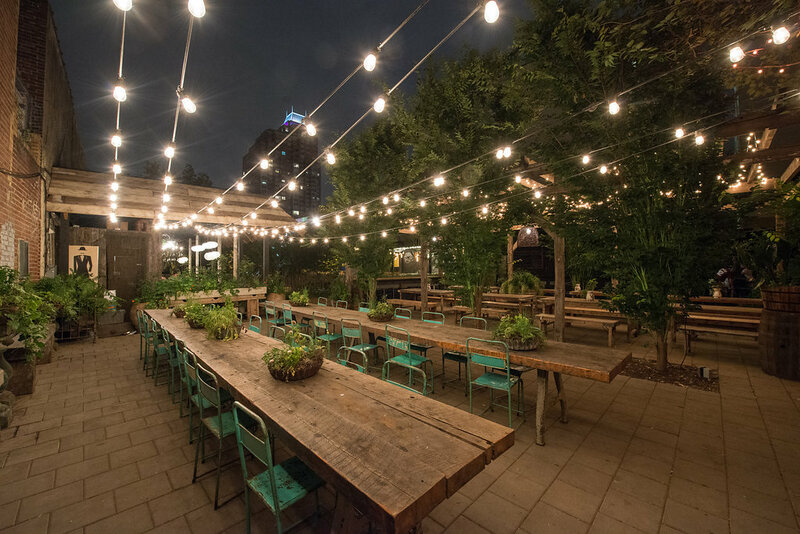 This year will have the benefit of a few spaces that can be enjoyed even during a summer rain. The fabulous skyline view of our great city from inside the space creates a really awesome juxtaposition. 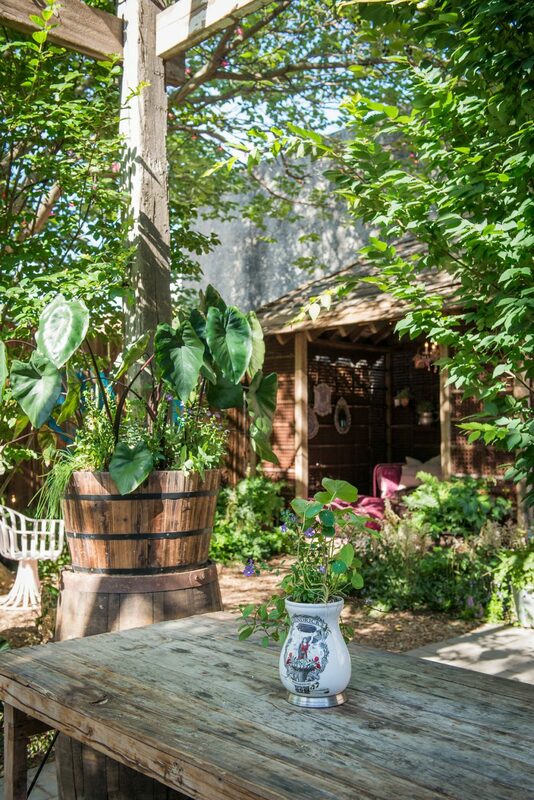 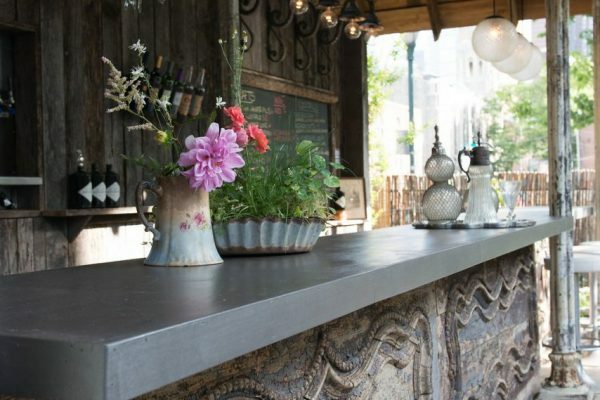 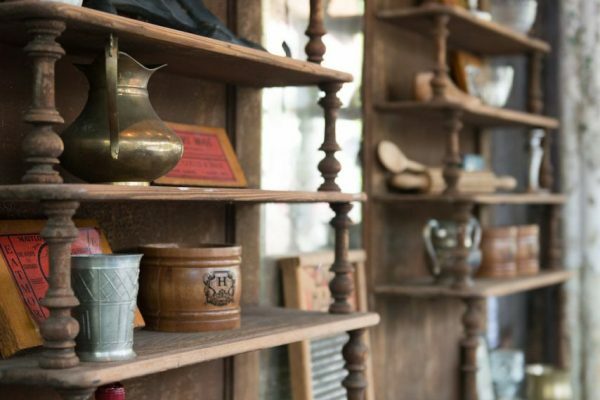 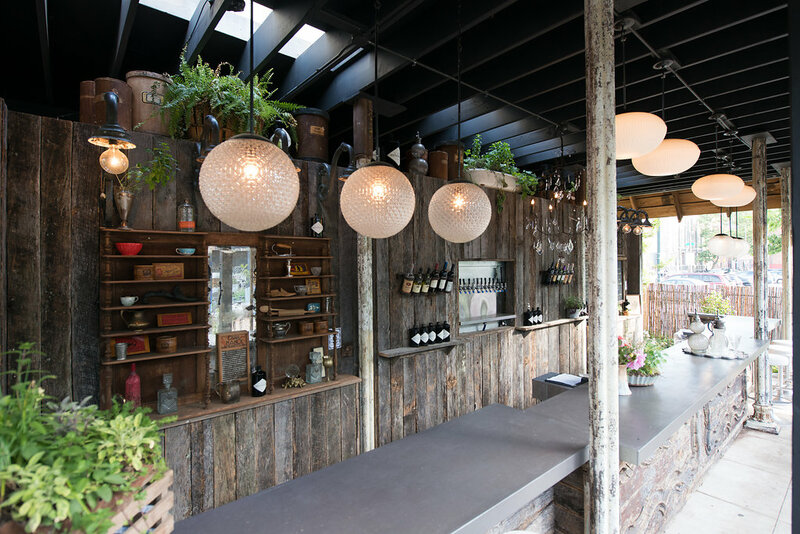 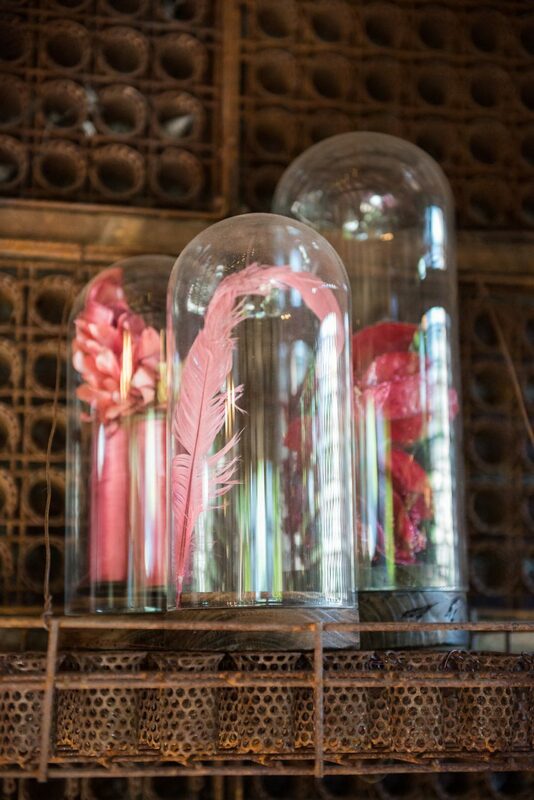 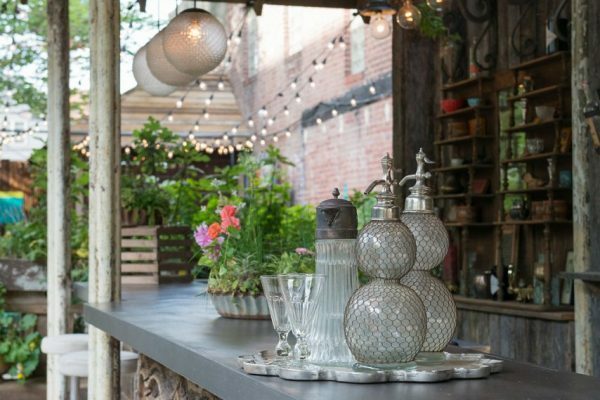 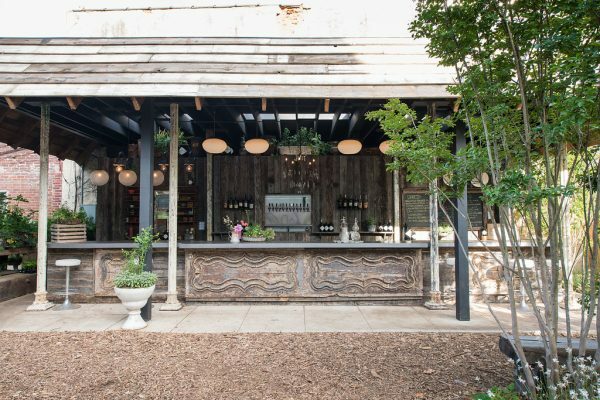 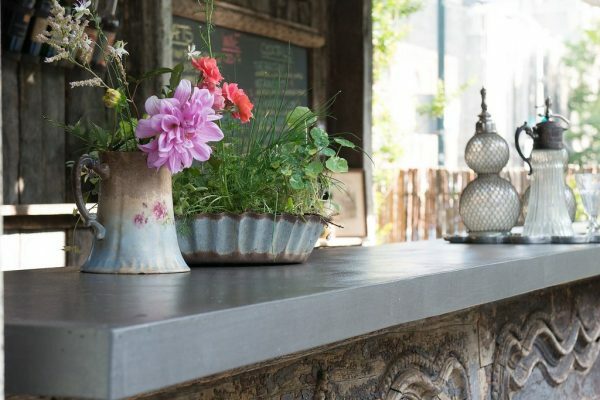 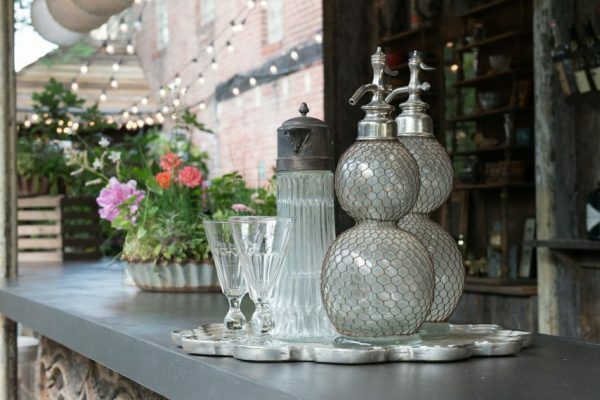 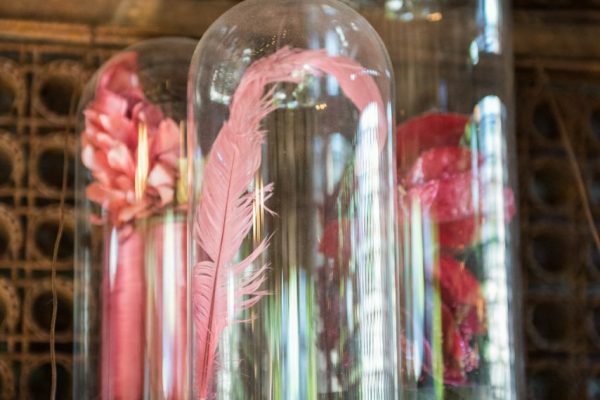 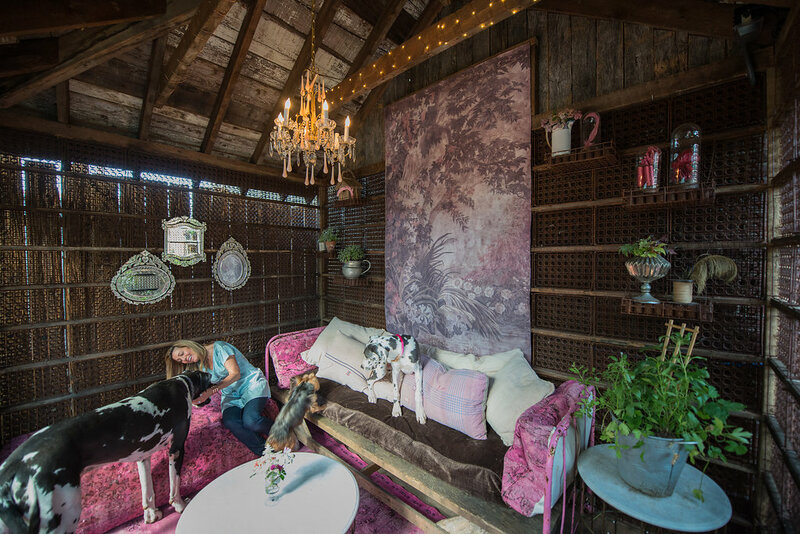 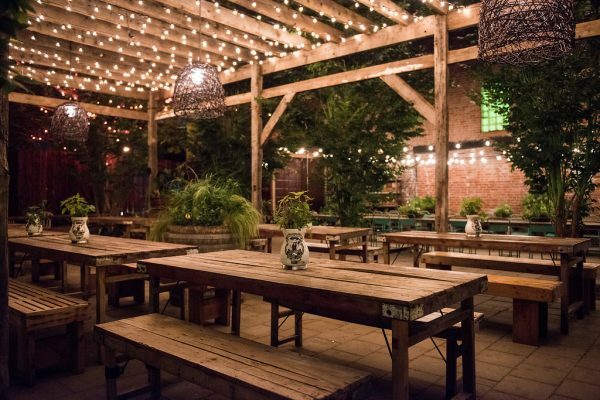 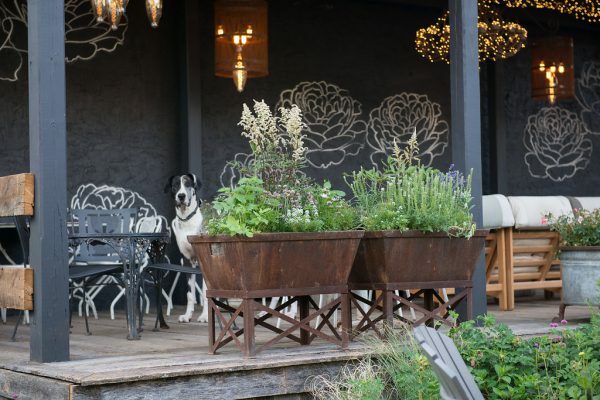 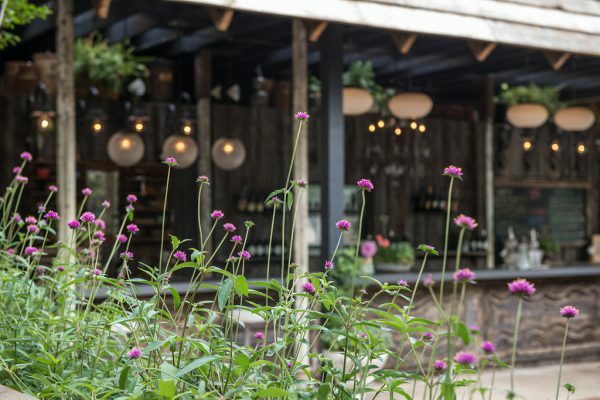 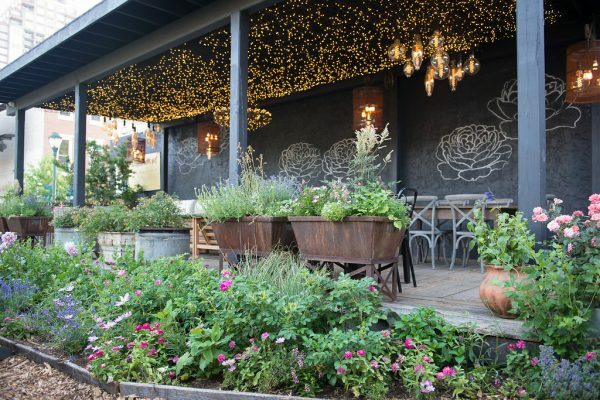 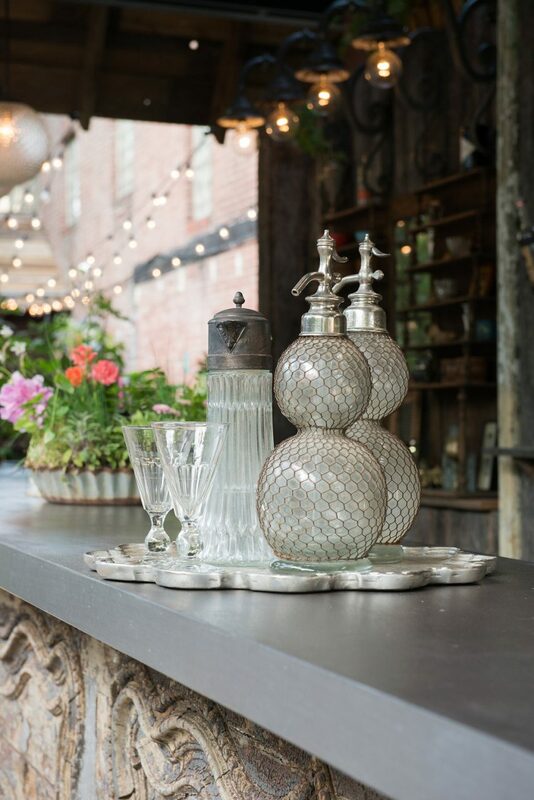 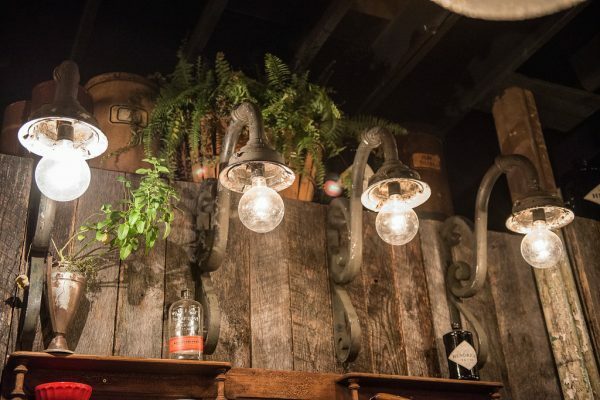 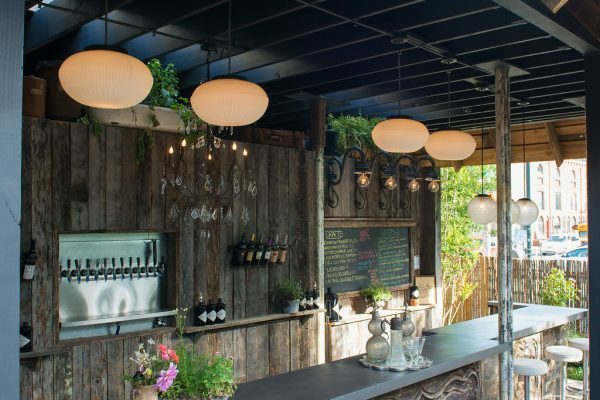 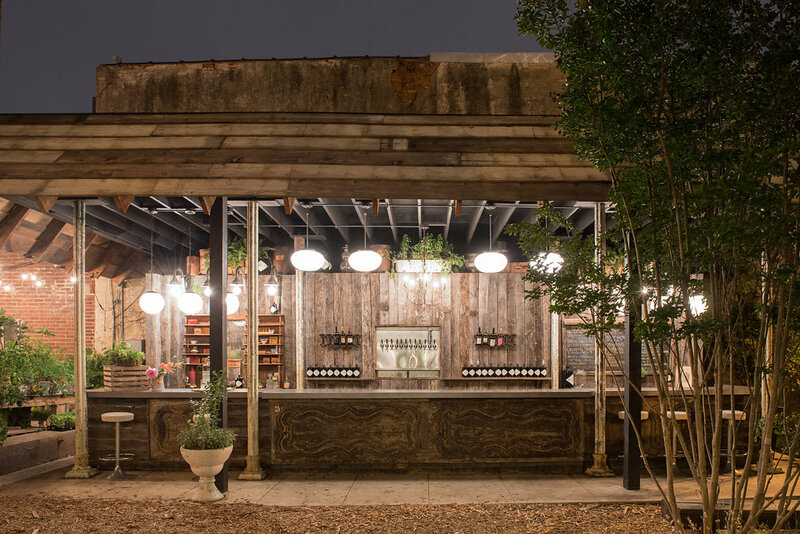 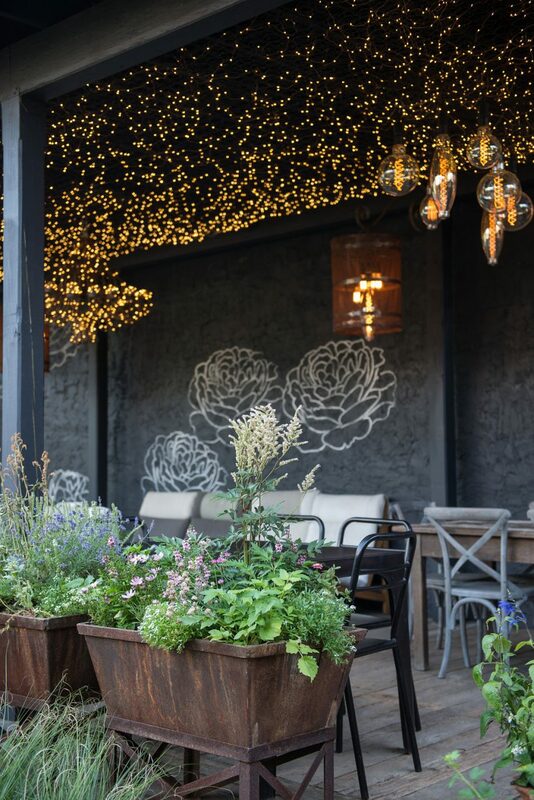 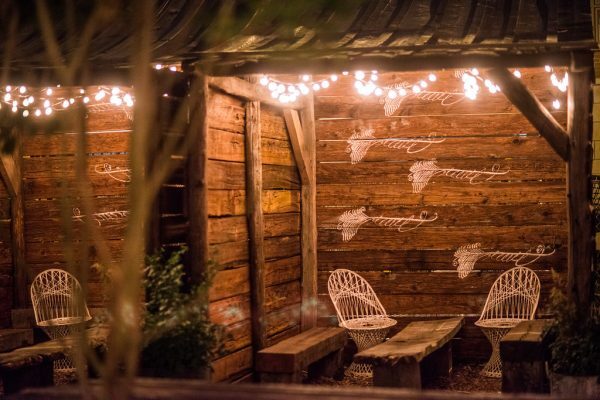 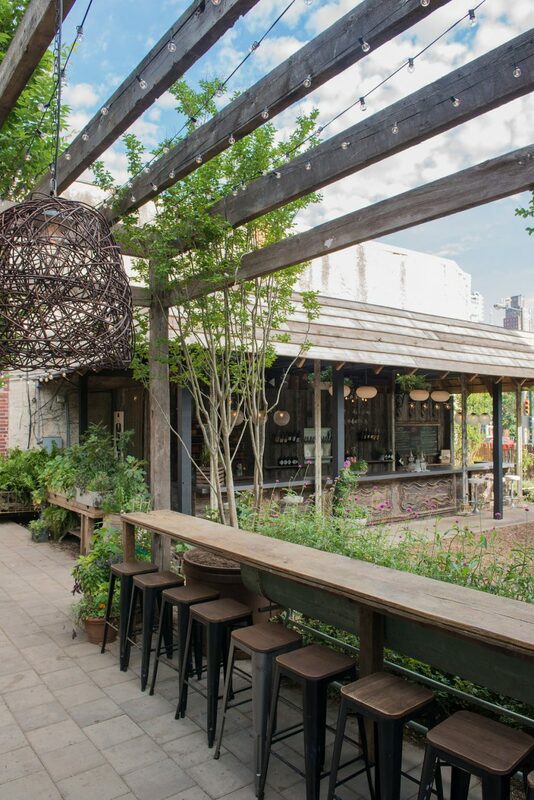 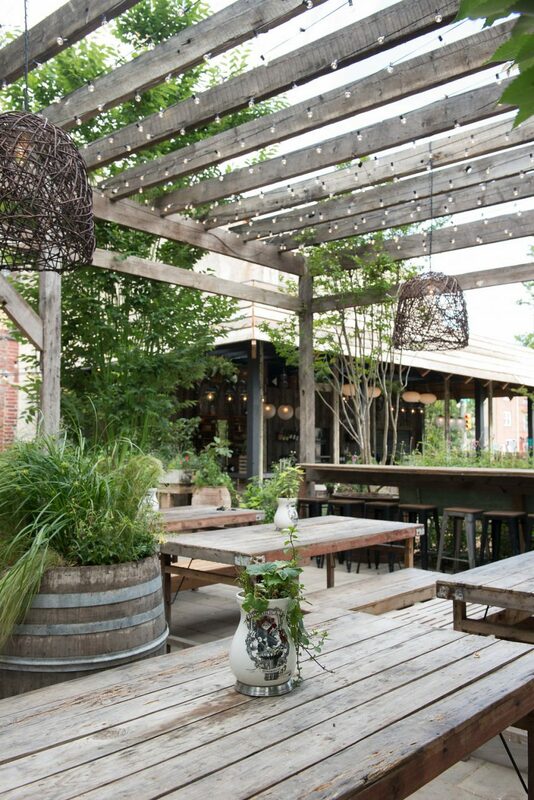 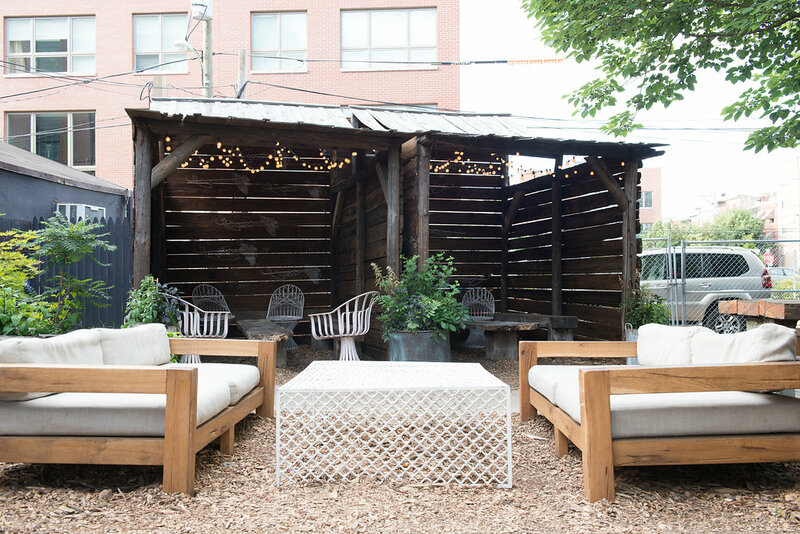 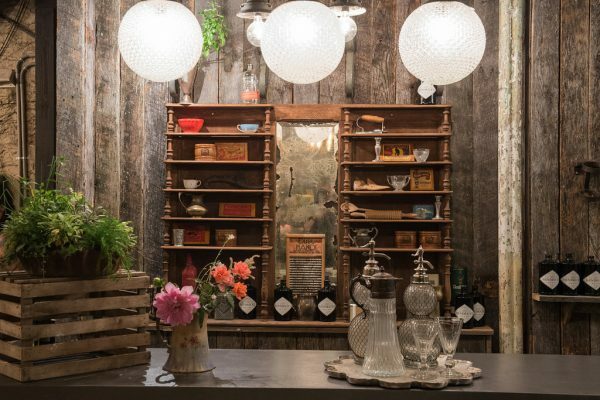 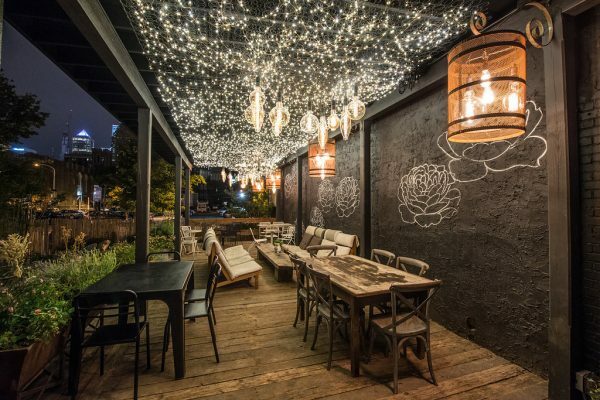 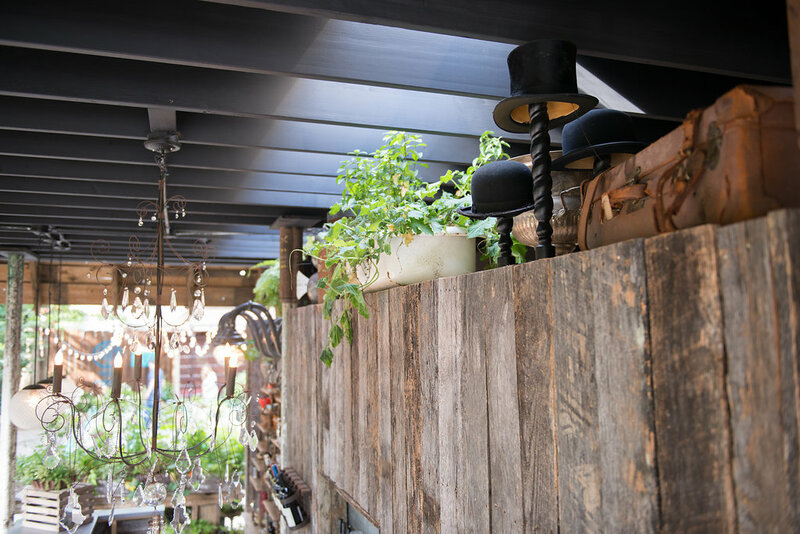 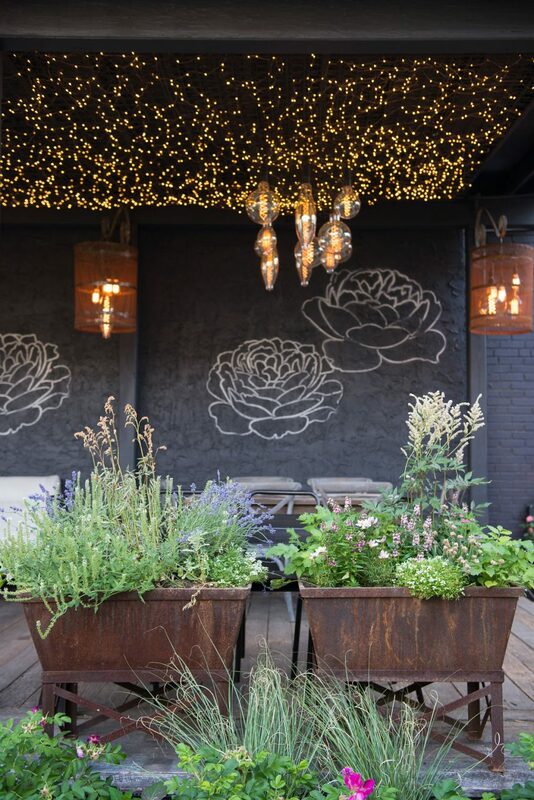 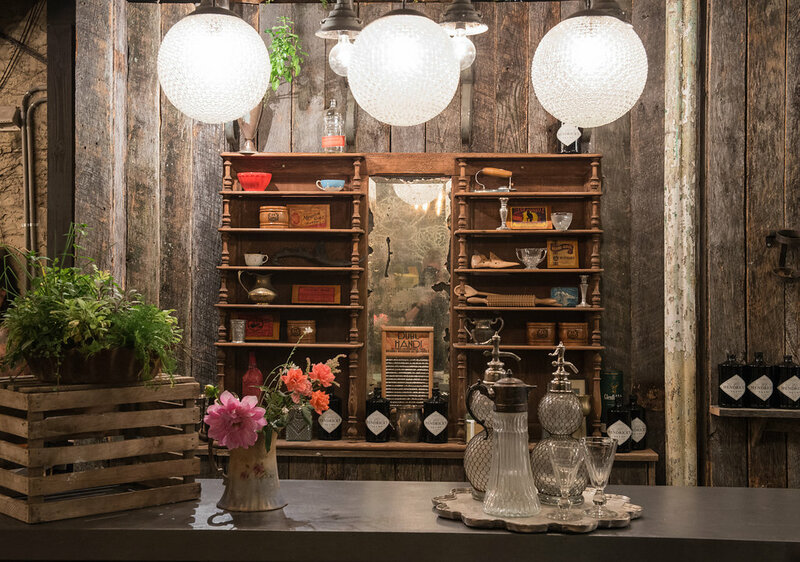 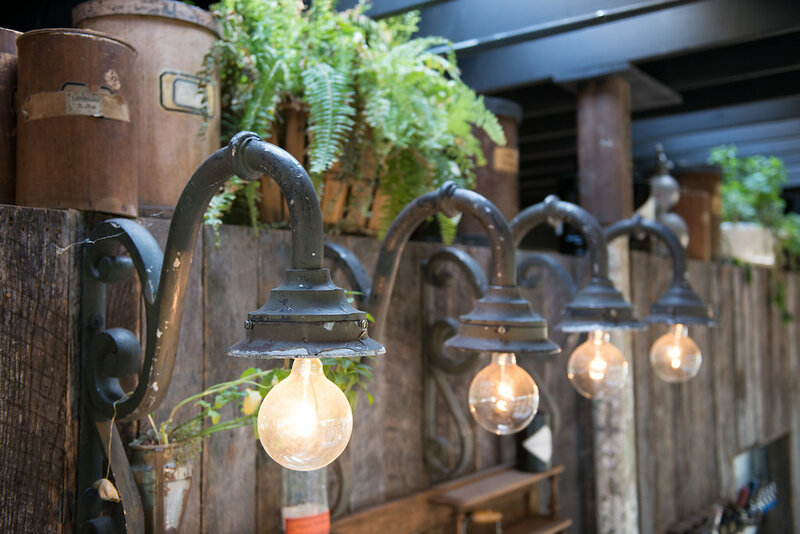 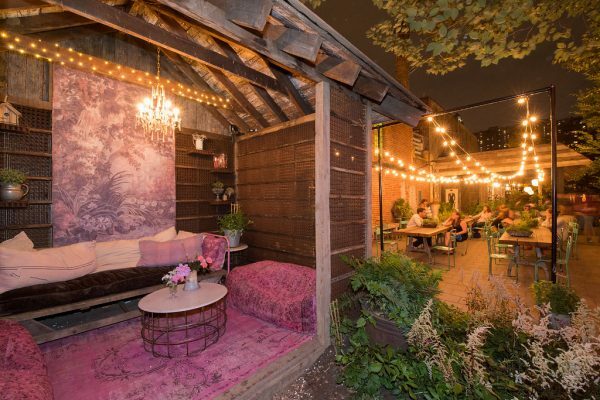 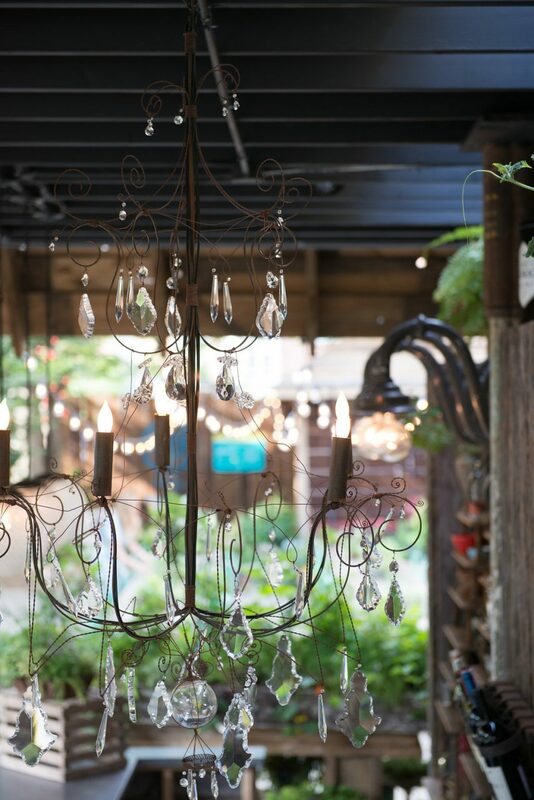 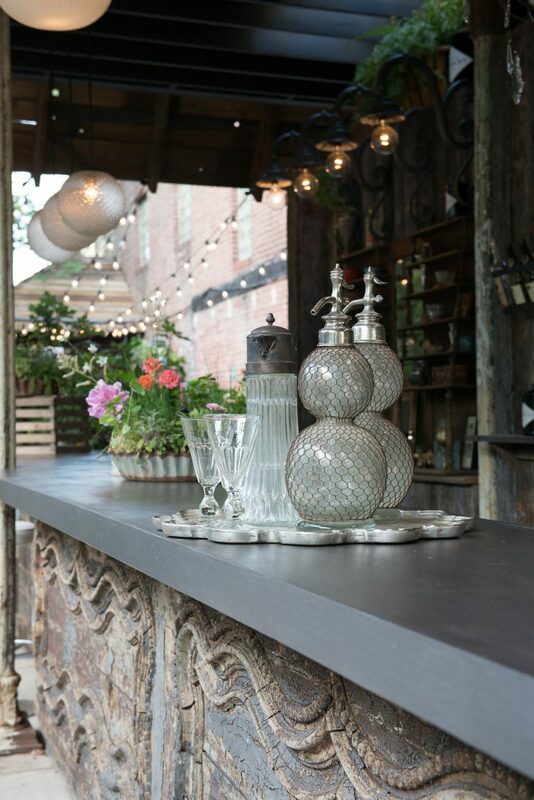 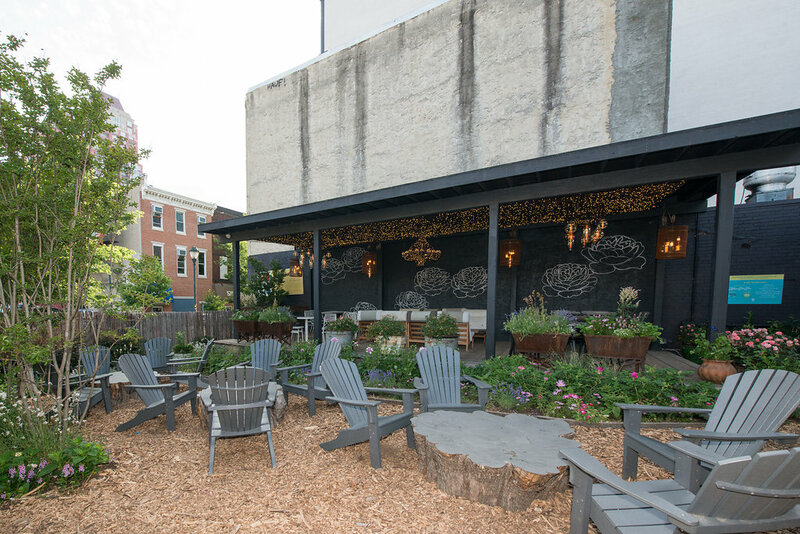 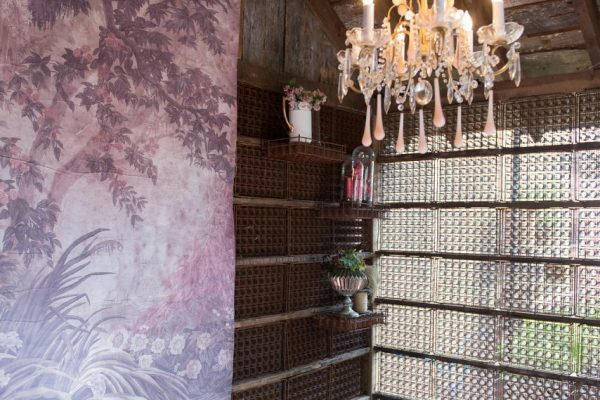 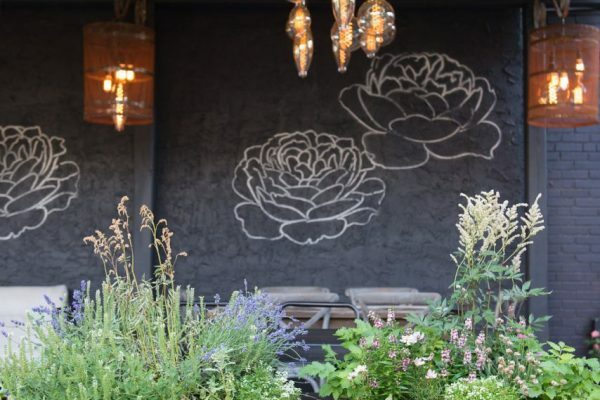 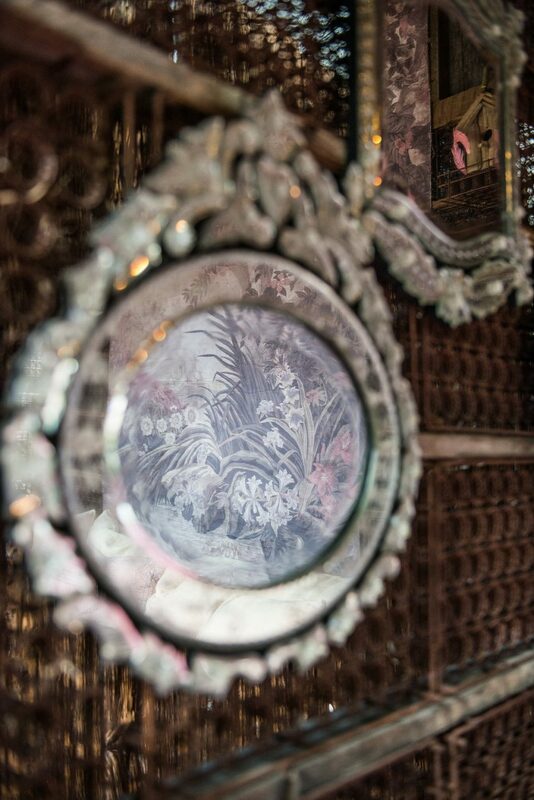 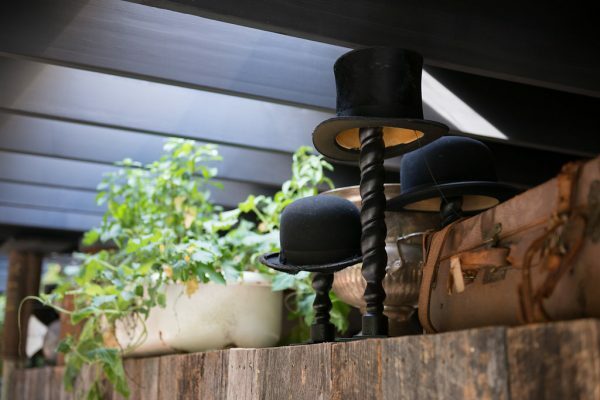 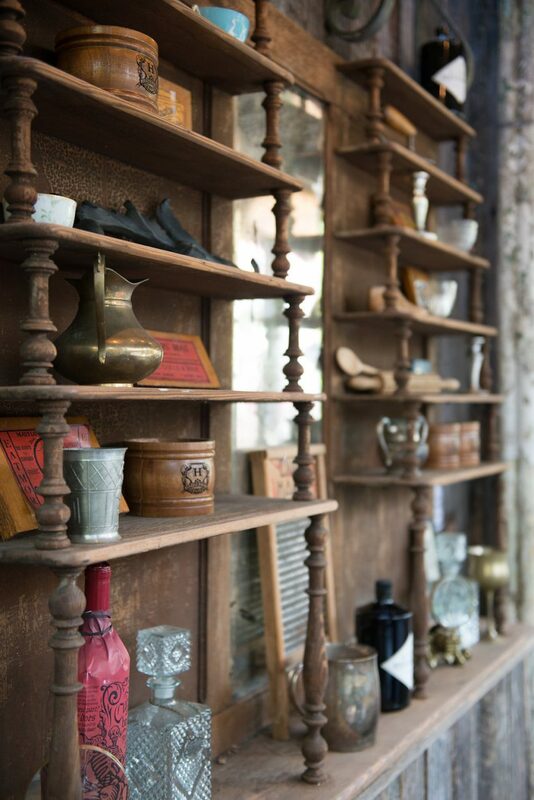 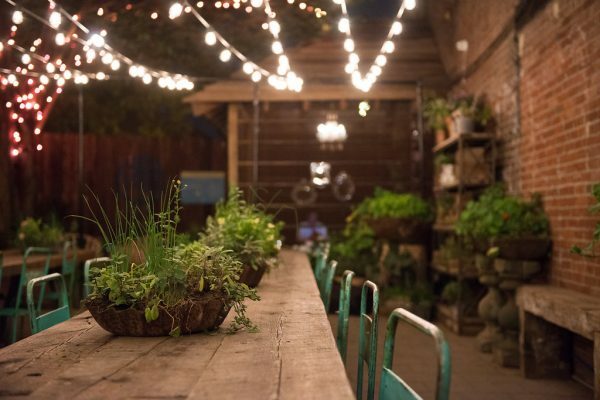 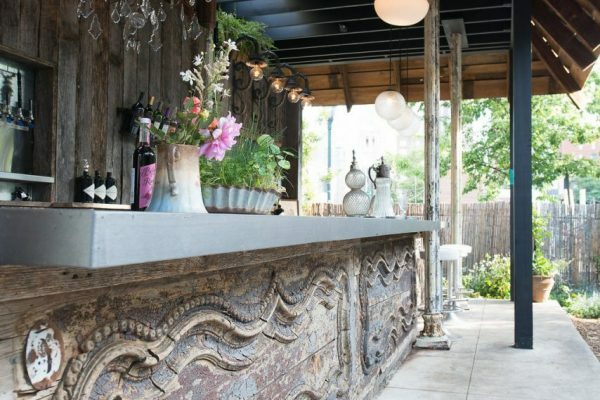 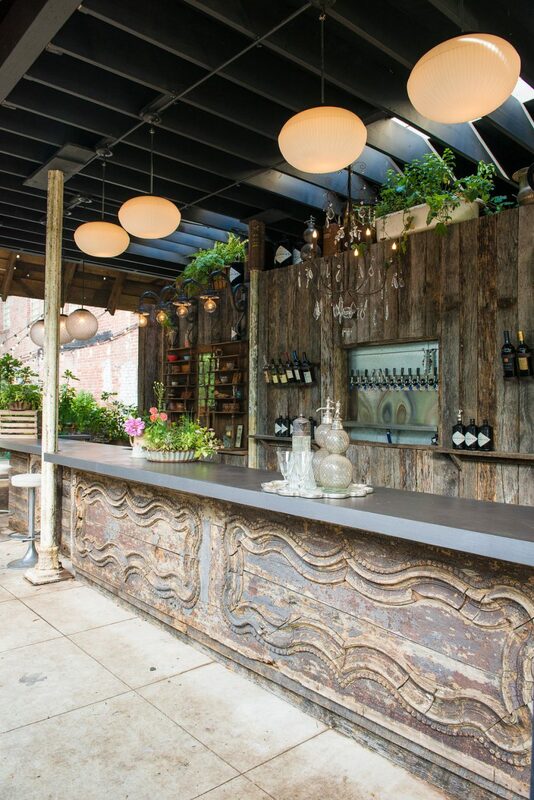 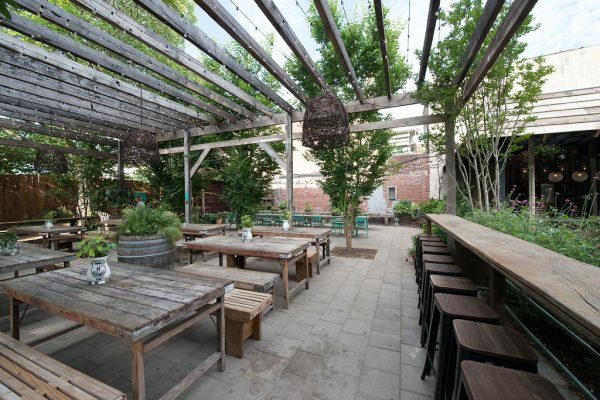 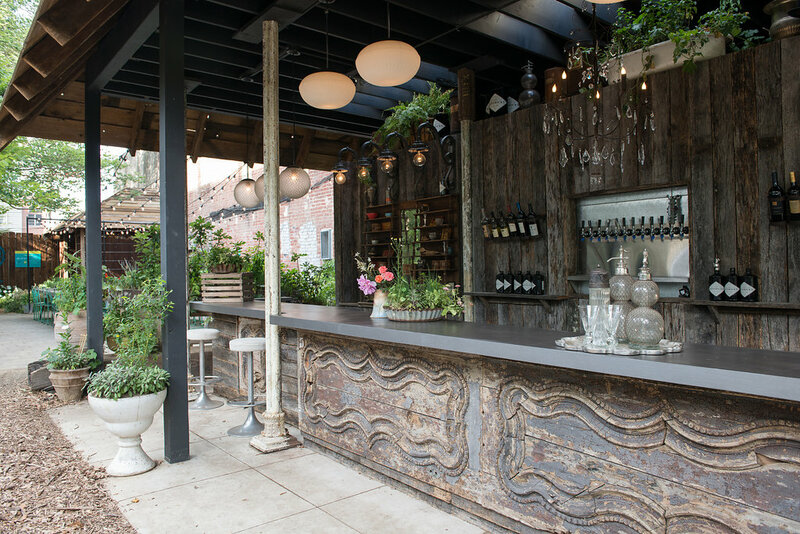 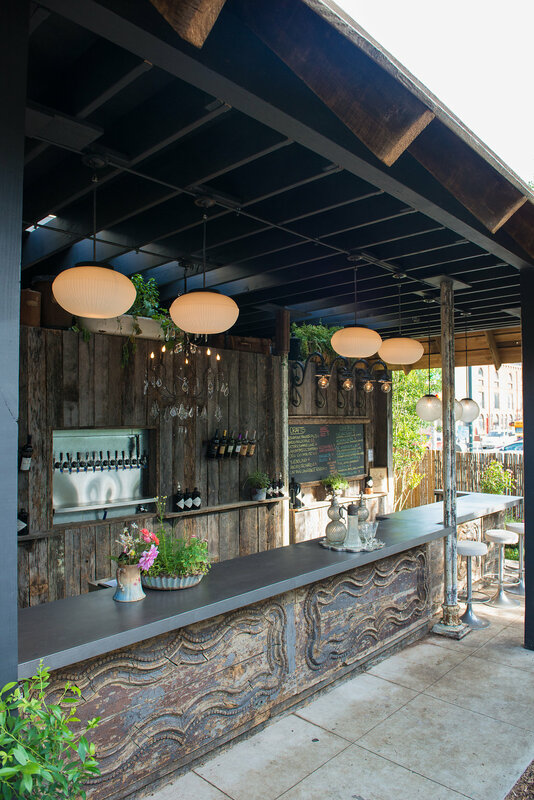 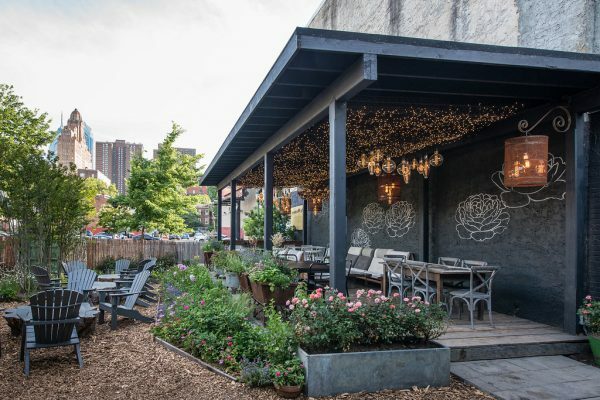 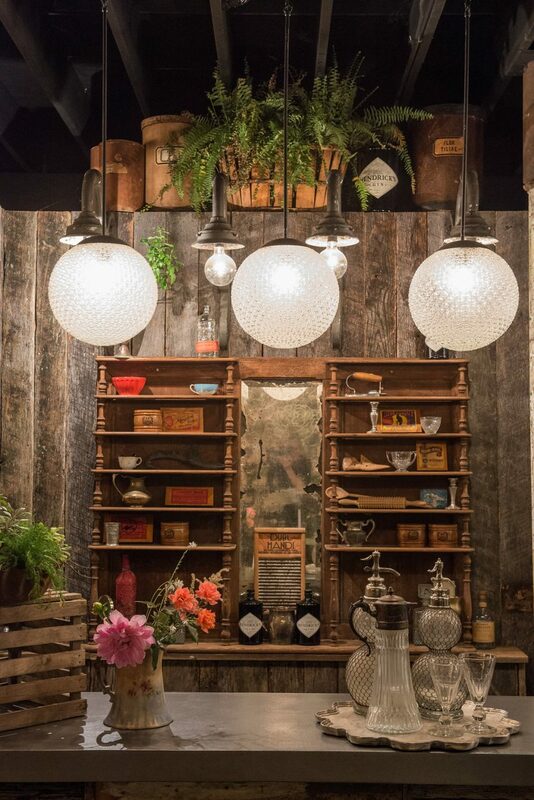 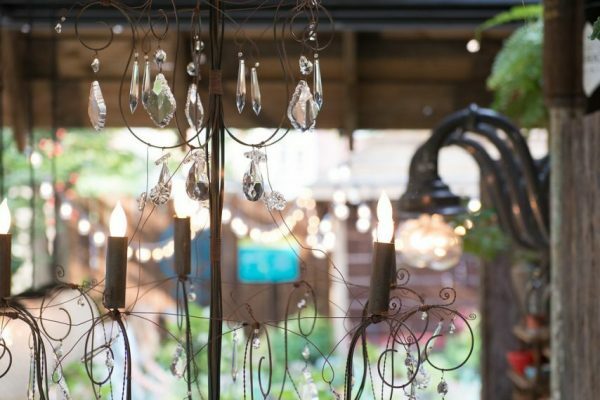 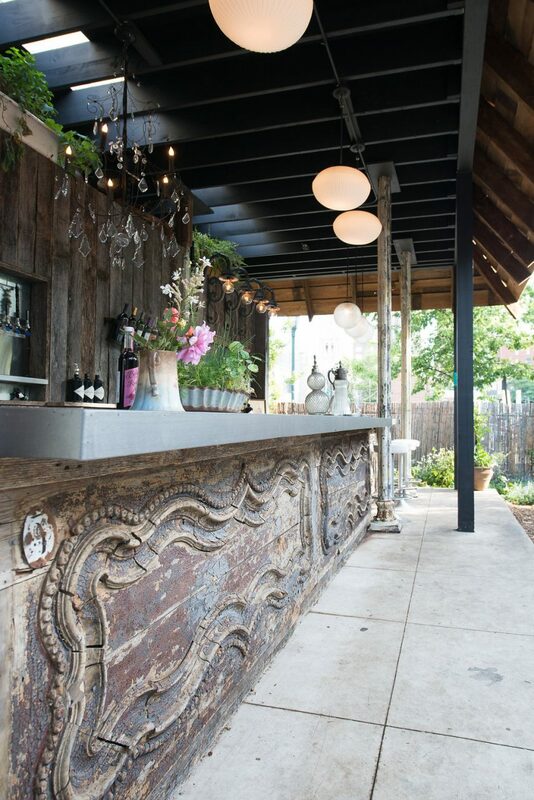 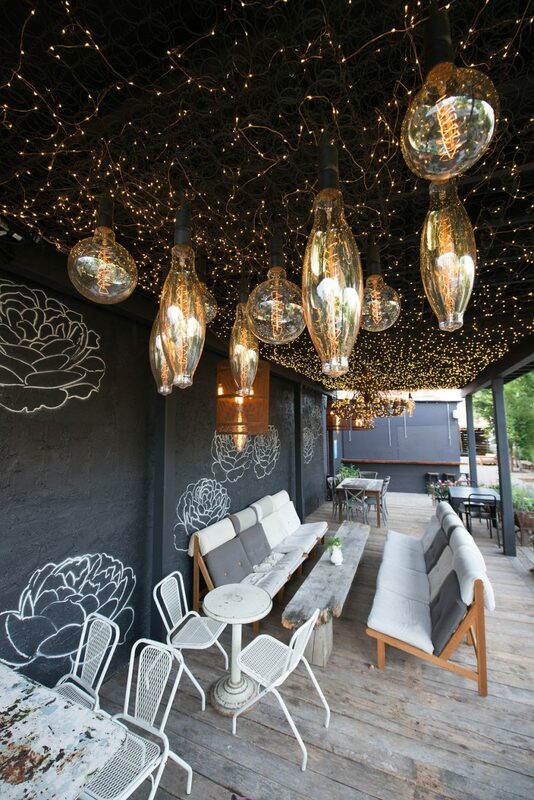 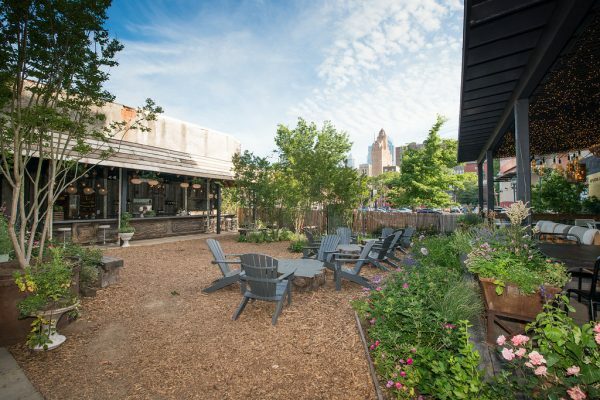 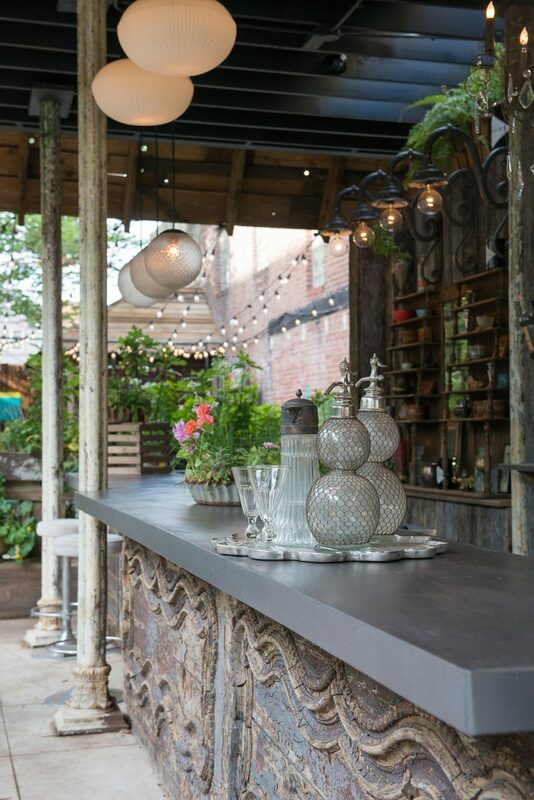 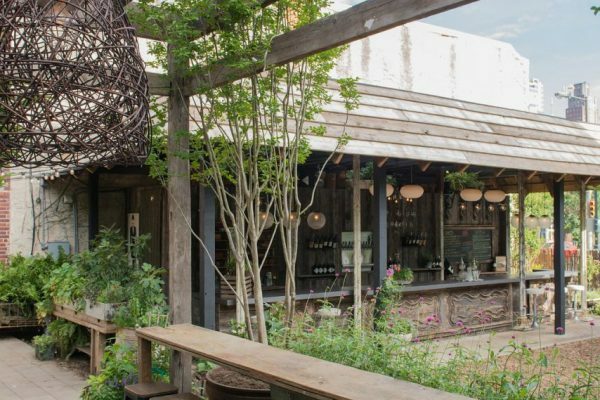 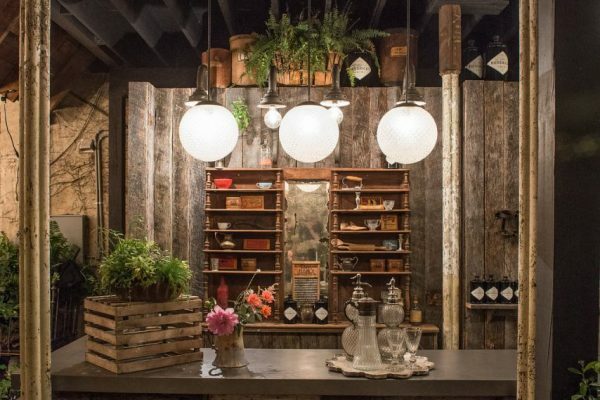 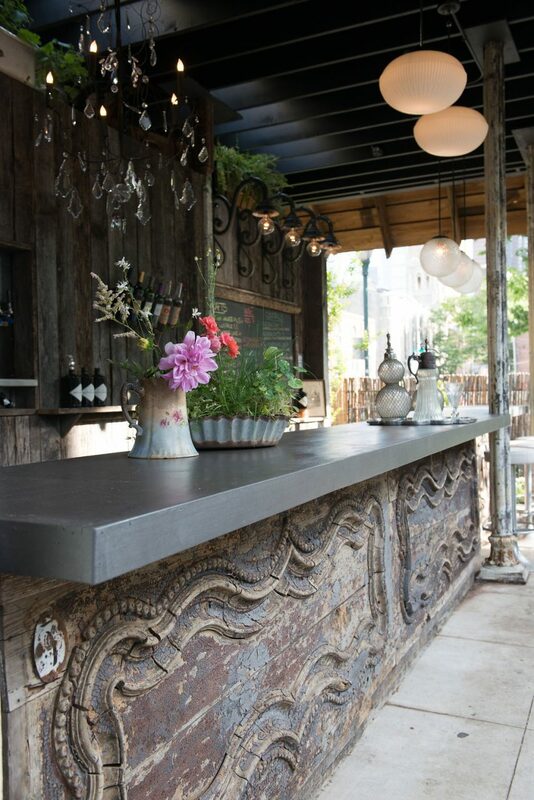 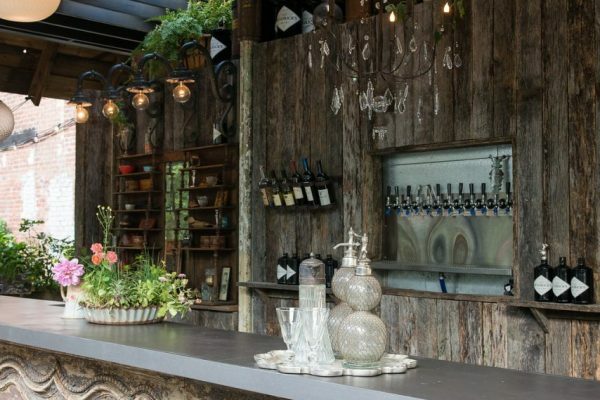 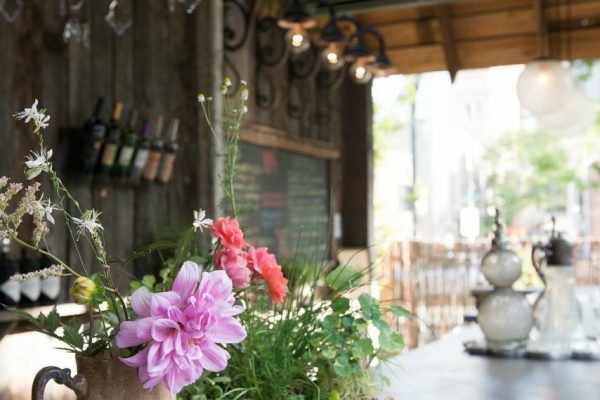 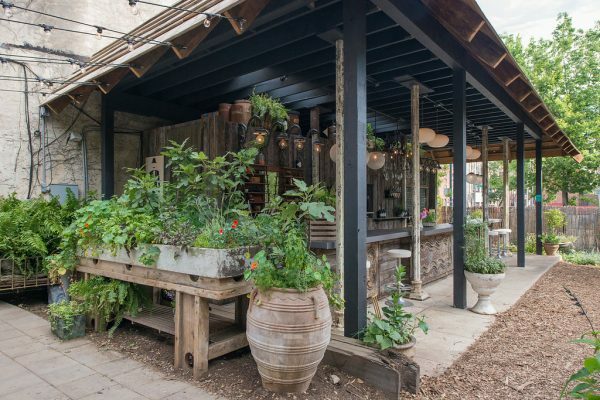 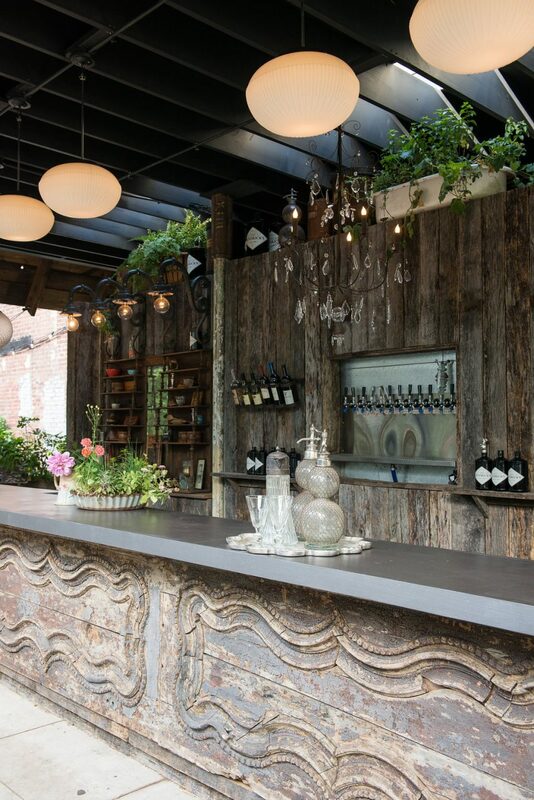 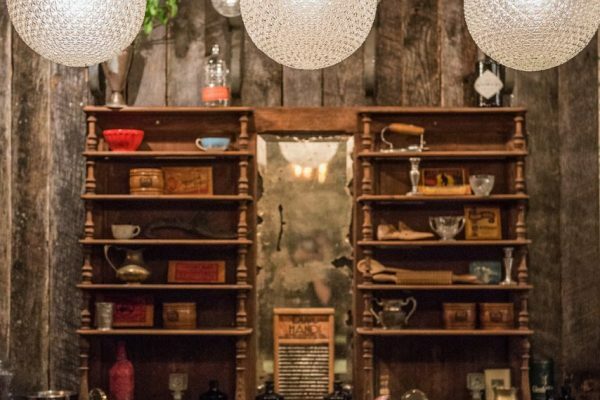 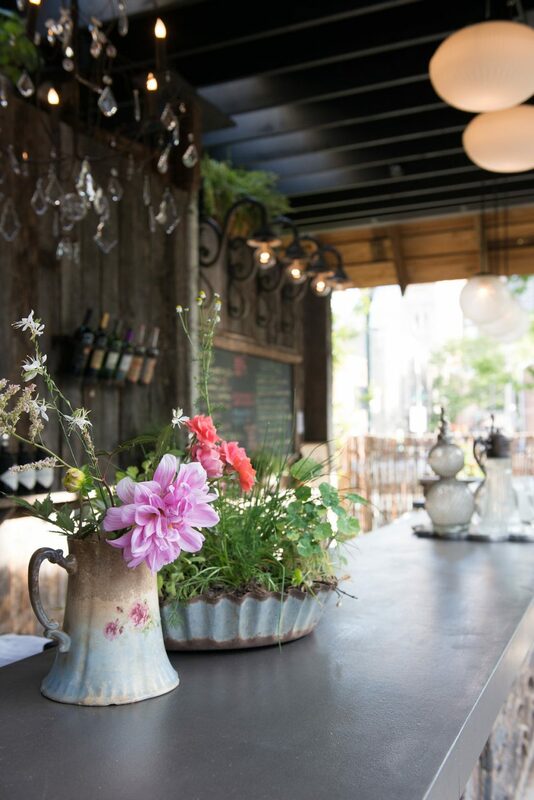 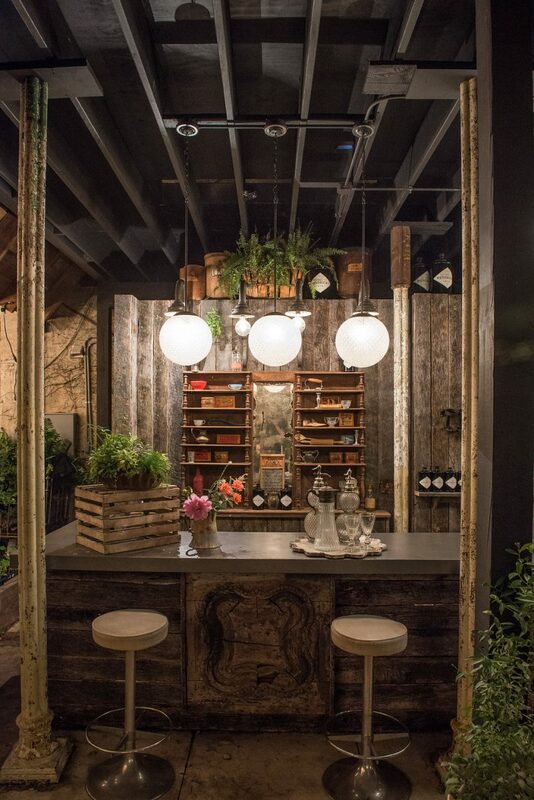 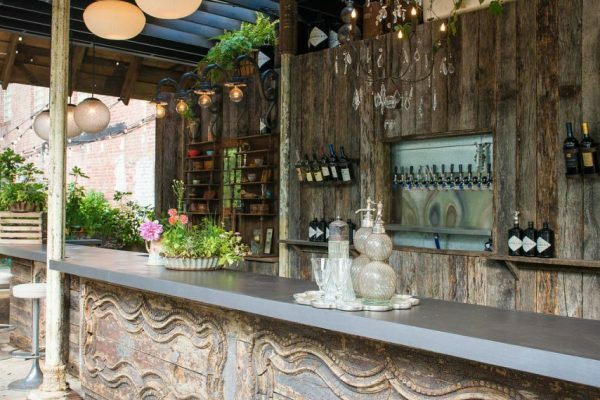 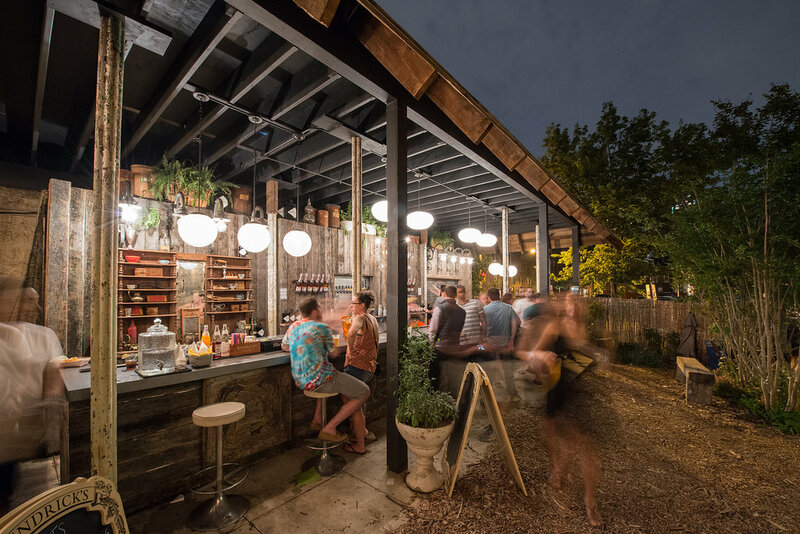 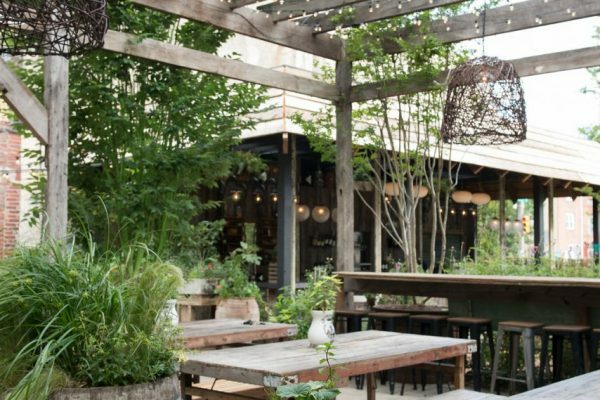 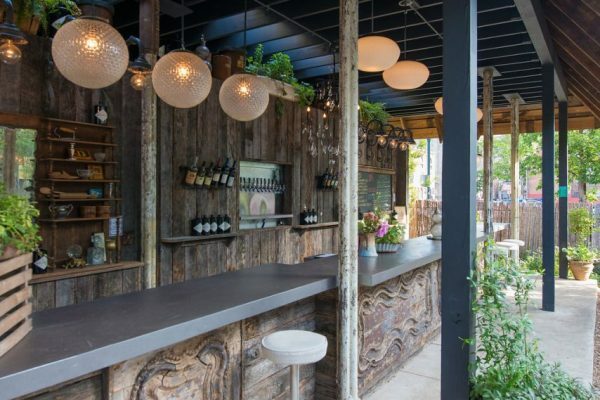 Lovely old timbers, deconstructed antique doors, vintage pendants, a delicate chandelier, curvy, ornate columns, mansard roof, french bistro shelf, and many curiosities make up the enormous, chic bar at the front of the garden. 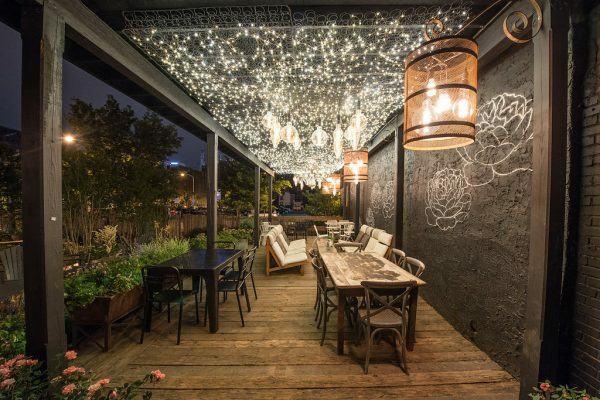 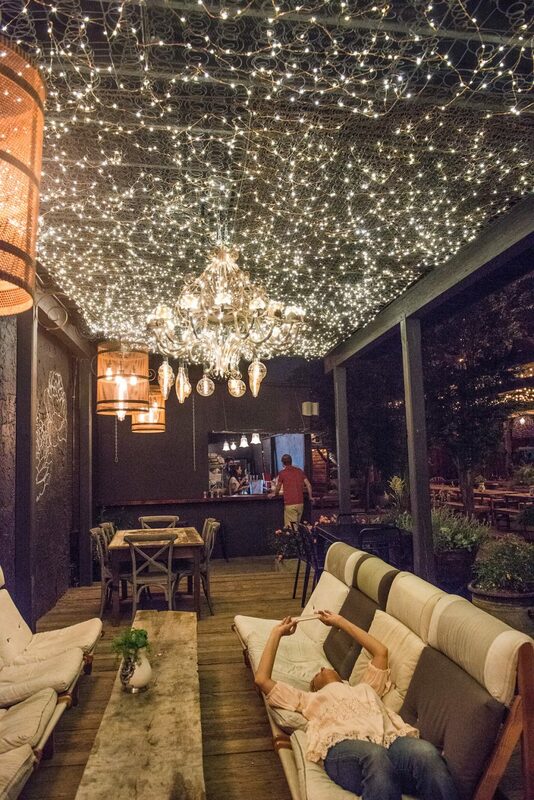 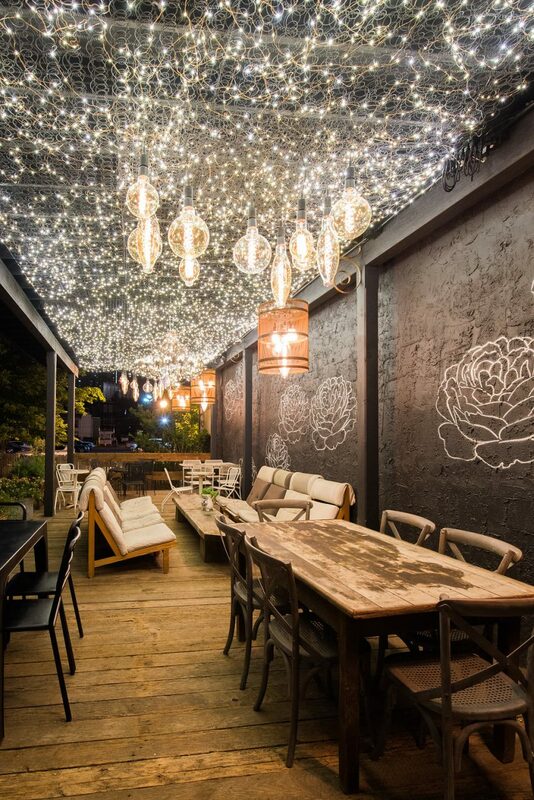 The elevated lounge has comfortable seating and is articulated by hundreds of twinkle lights. 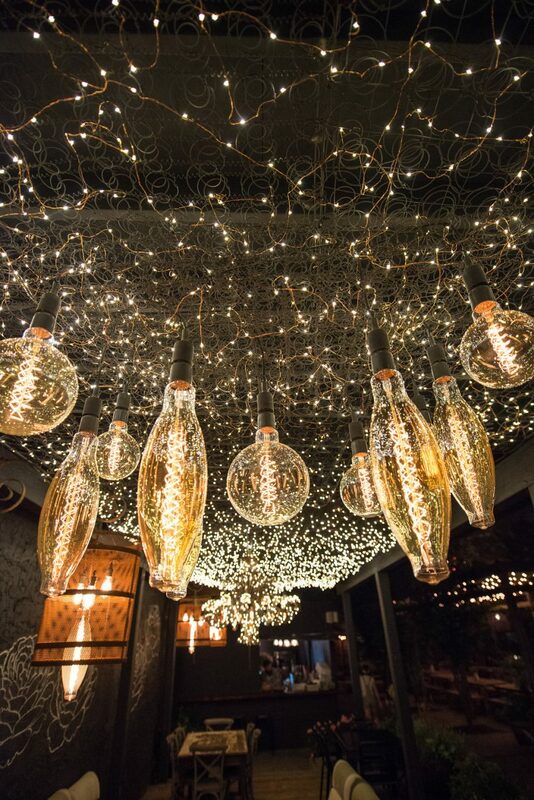 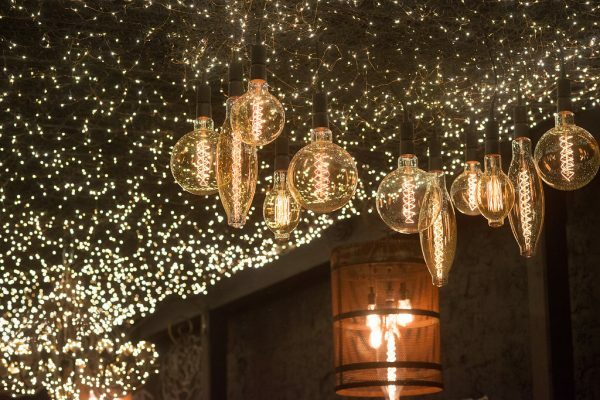 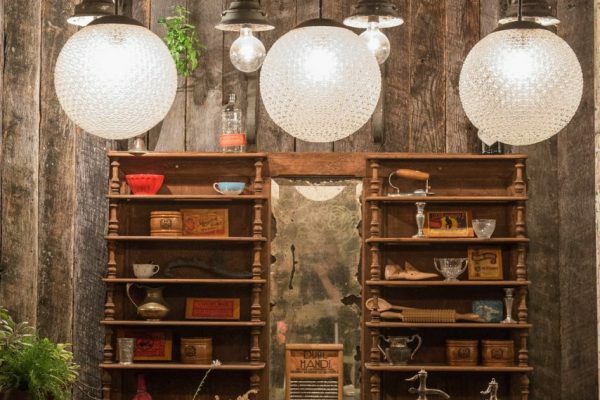 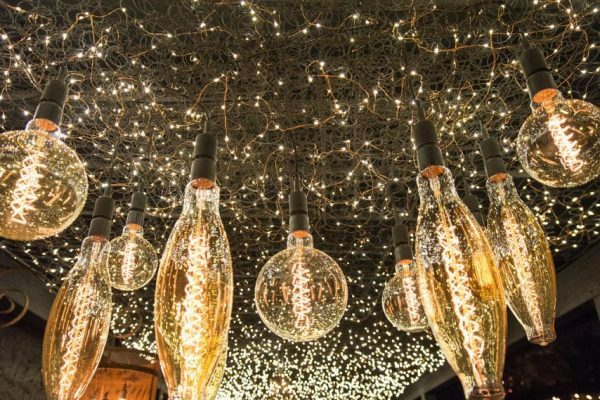 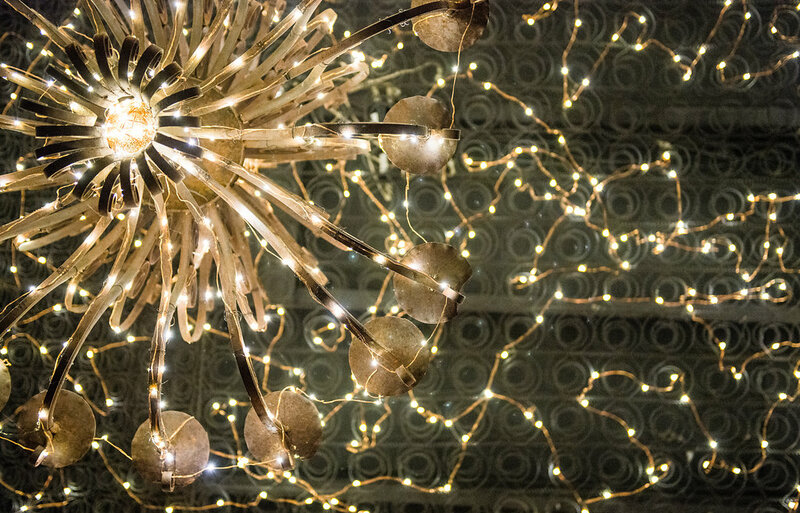 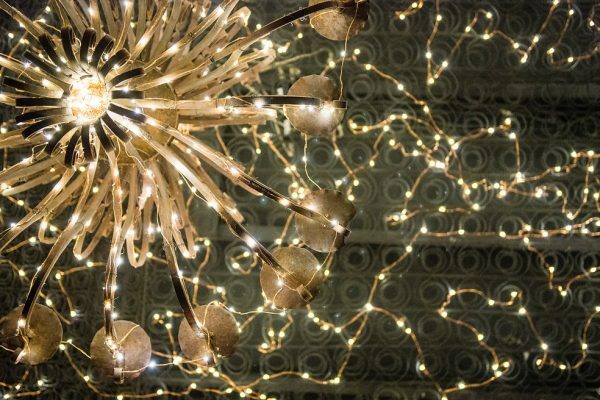 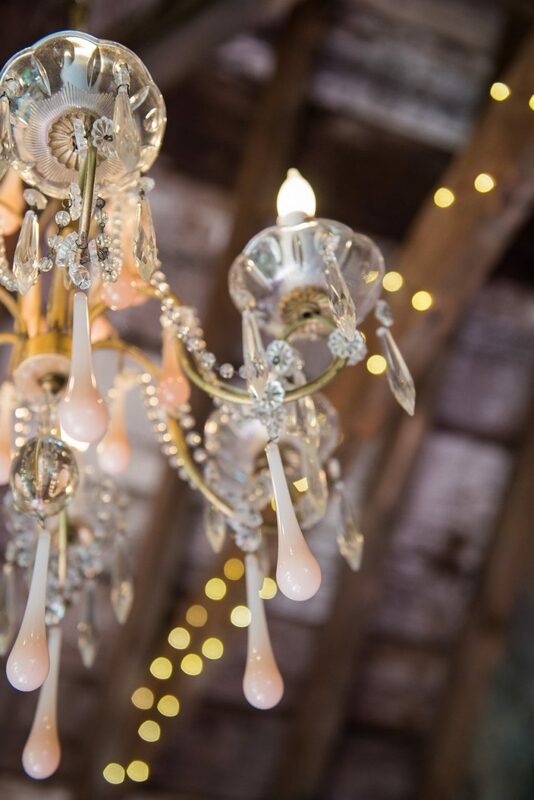 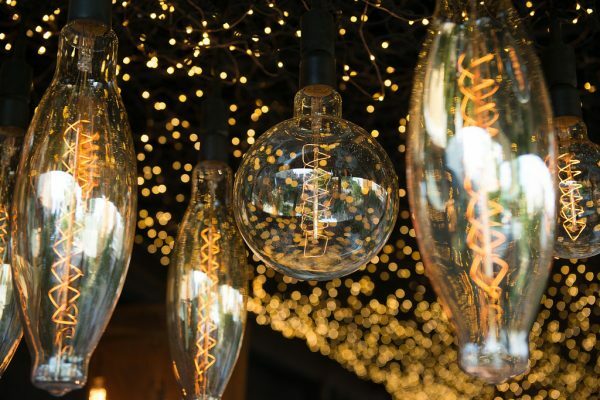 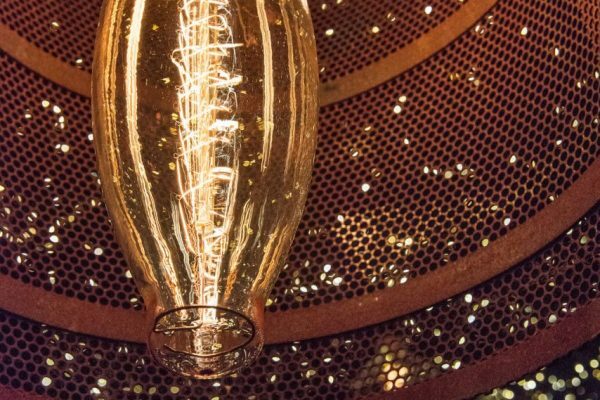 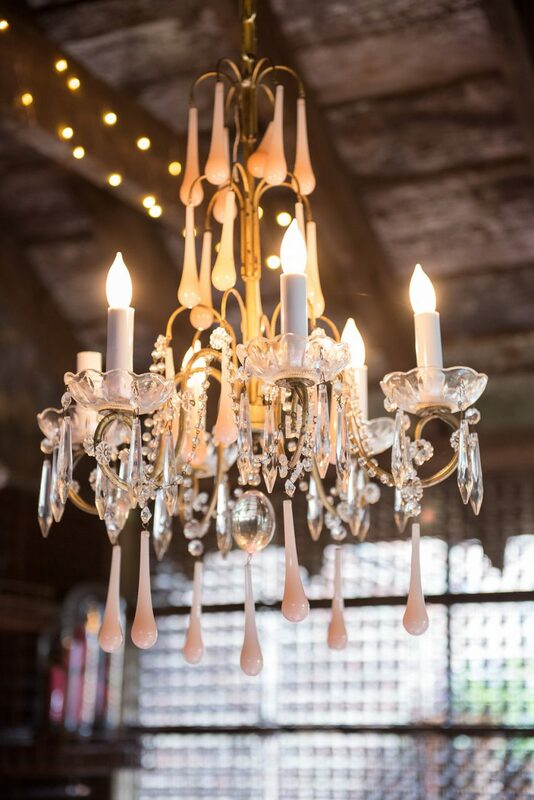 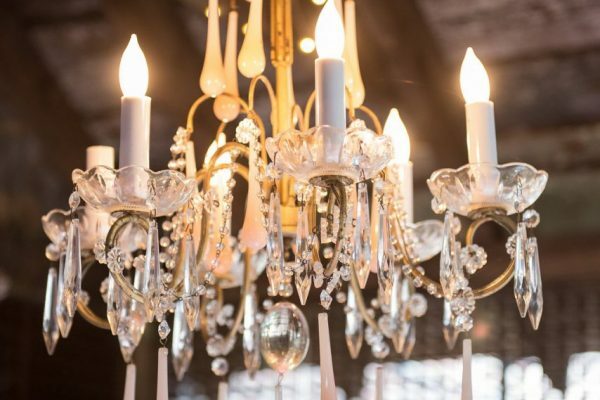 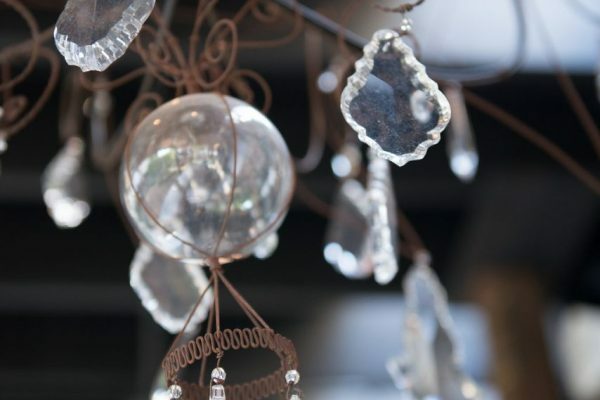 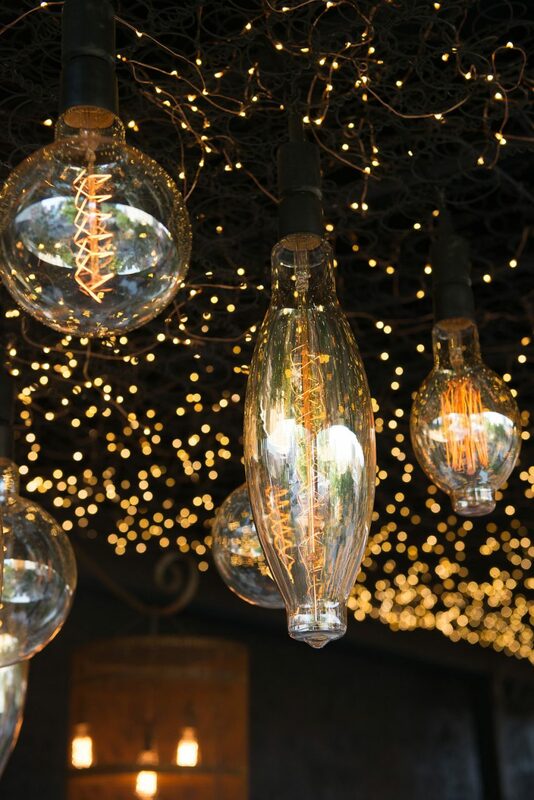 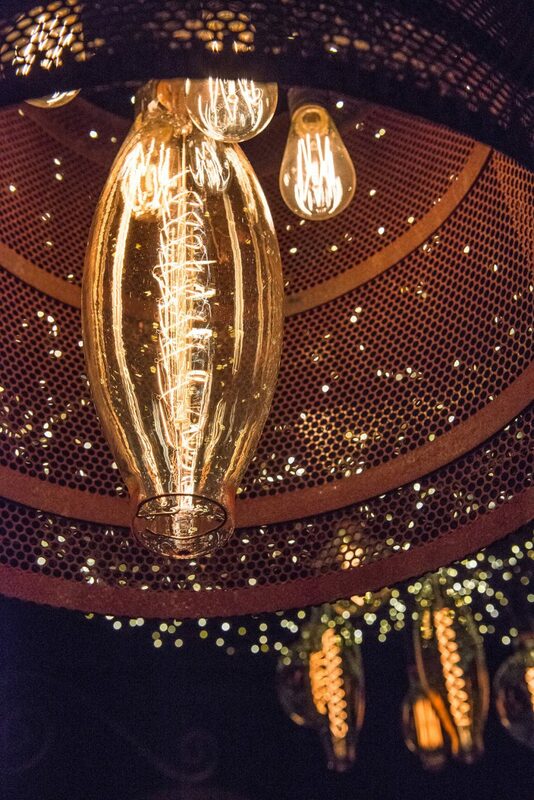 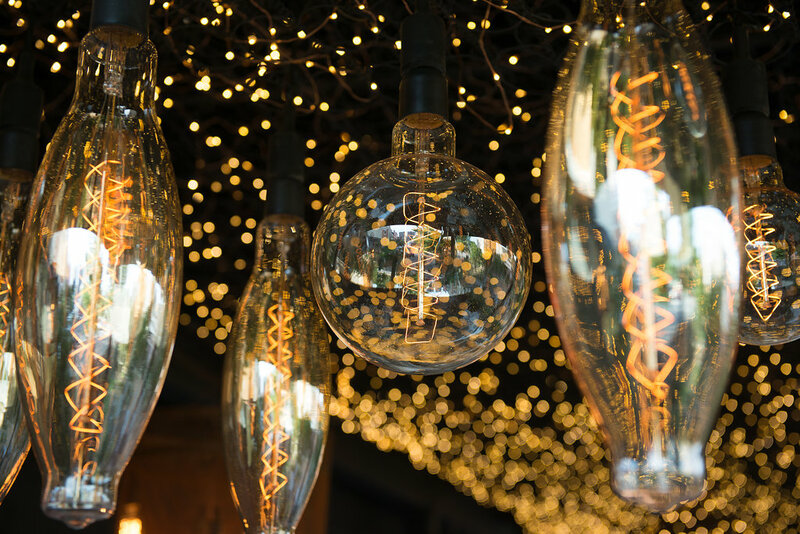 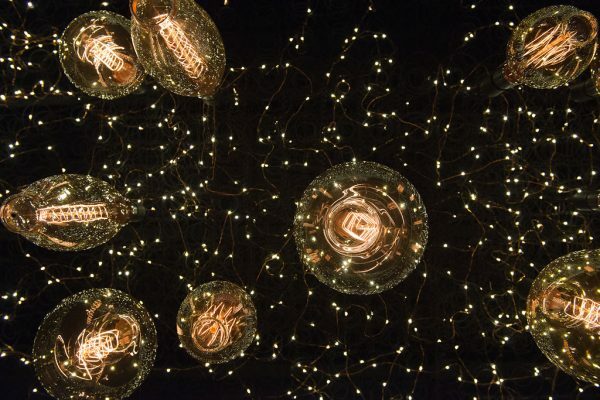 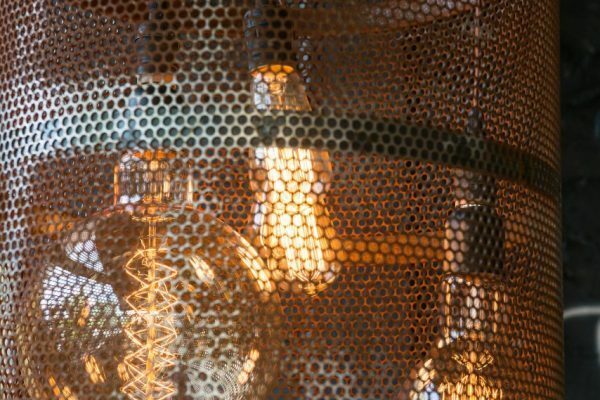 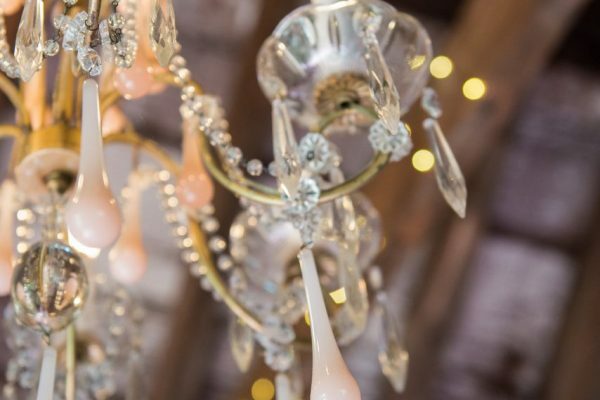 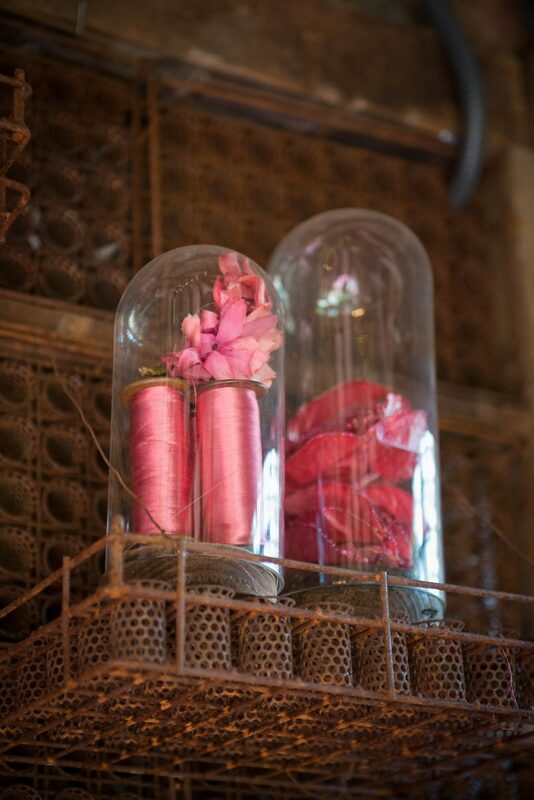 Chandeliers were created by adaptively reusing factory crates and stunning Edison bulbs; artwork in and of themselves. 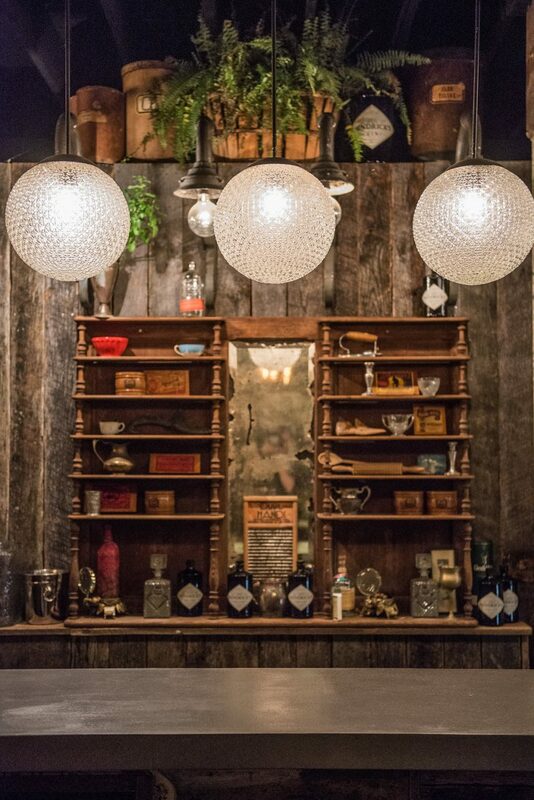 The lounge doubles as a stage when there is live music or a presentation. 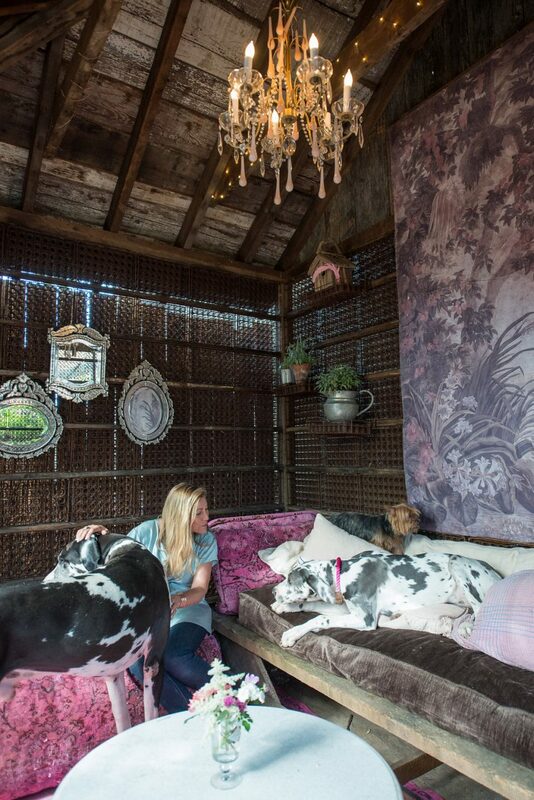 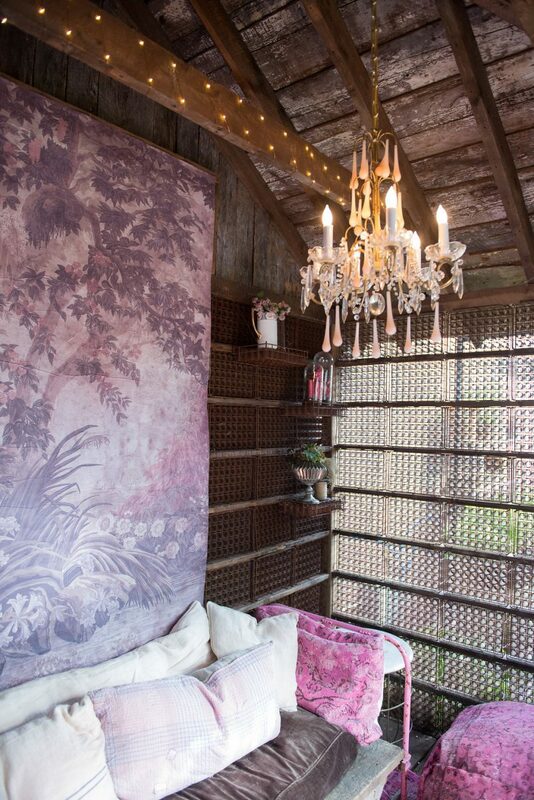 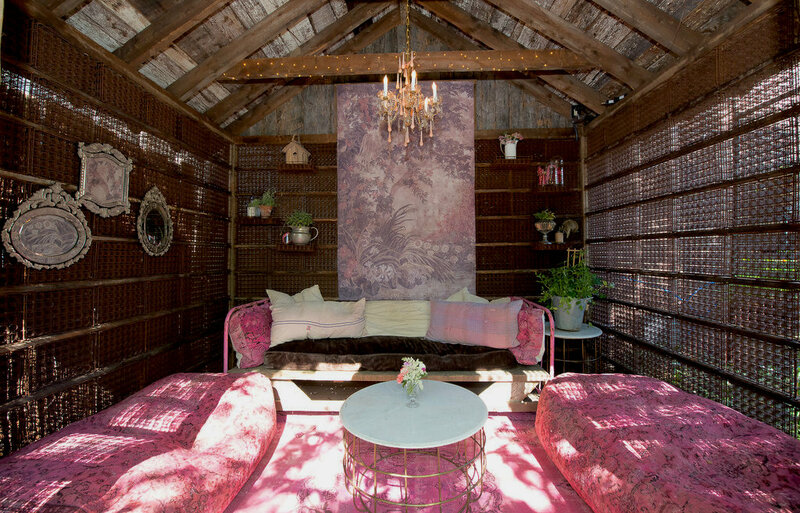 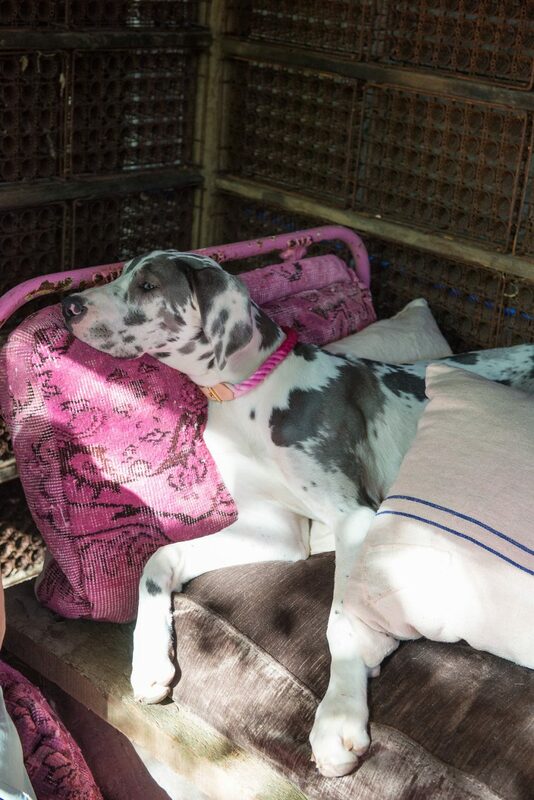 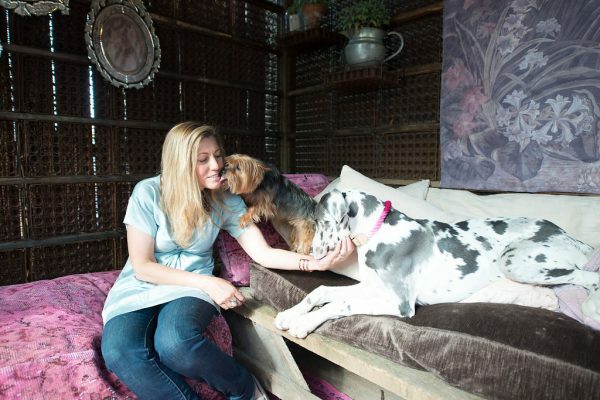 The cabana’s are articulated with the Tallulah feather and soft lighting. 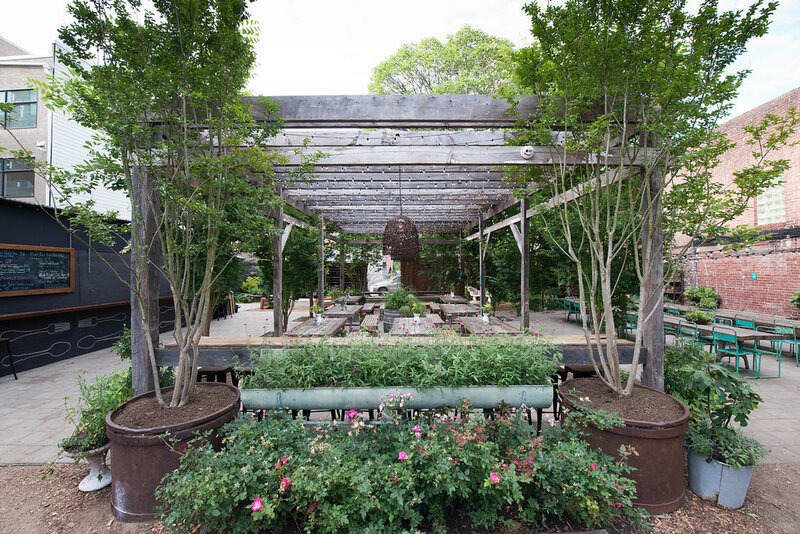 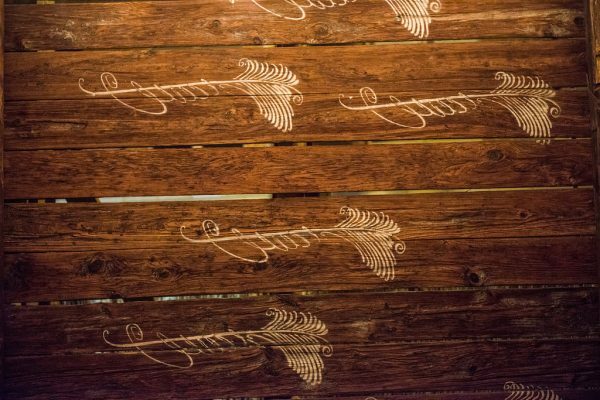 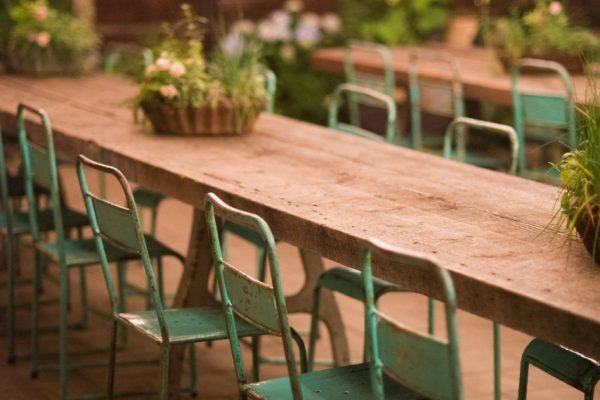 Barn beams were used to create the benches and the tables. 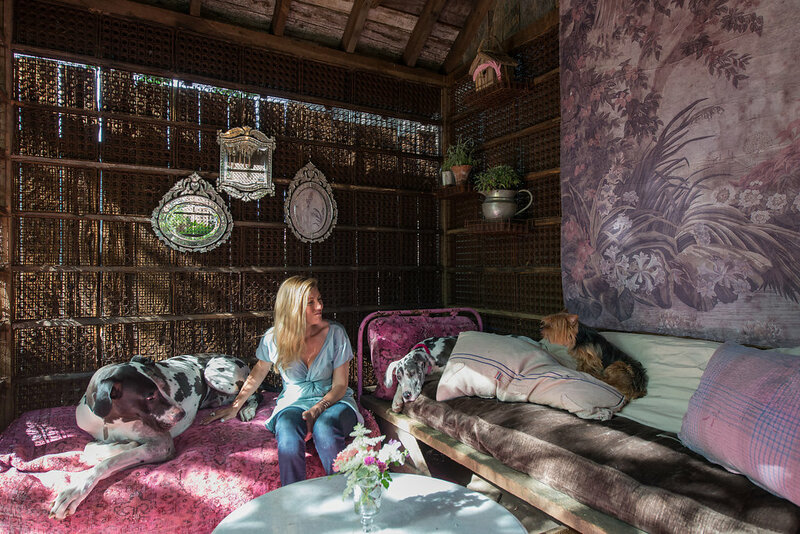 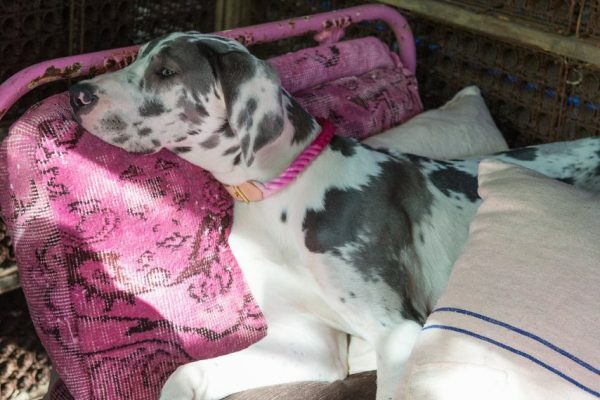 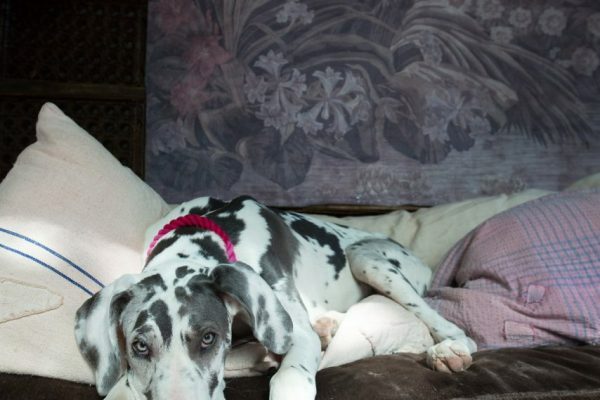 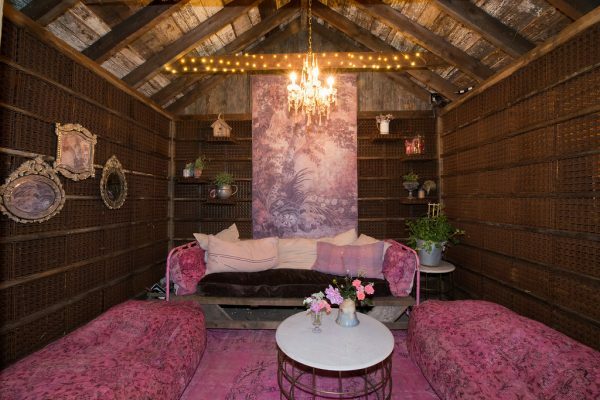 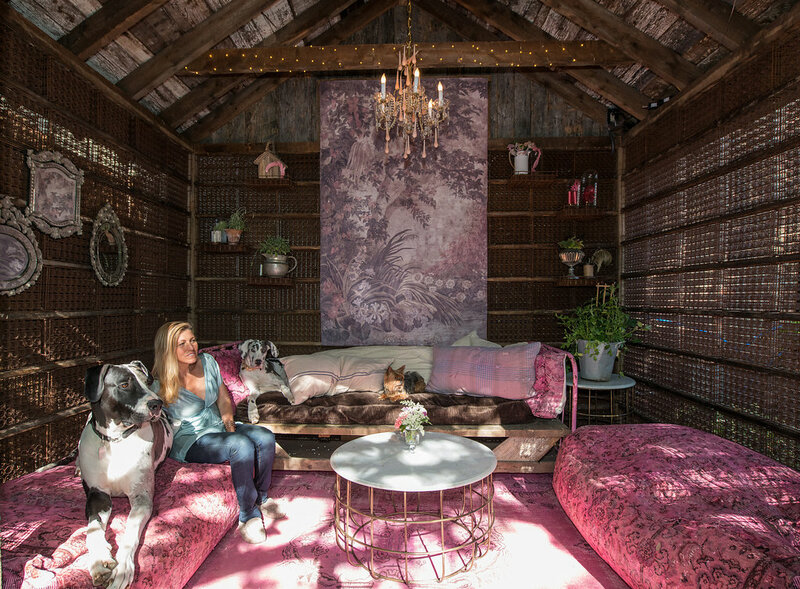 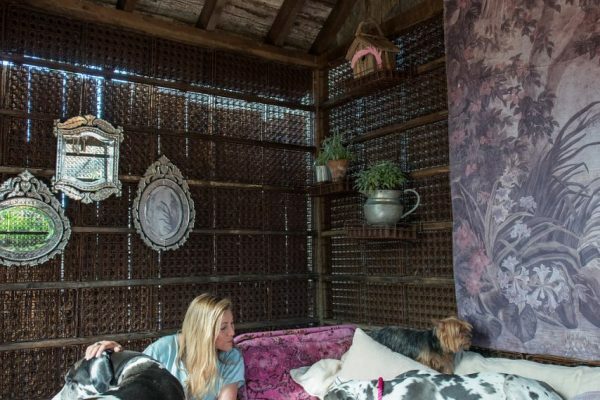 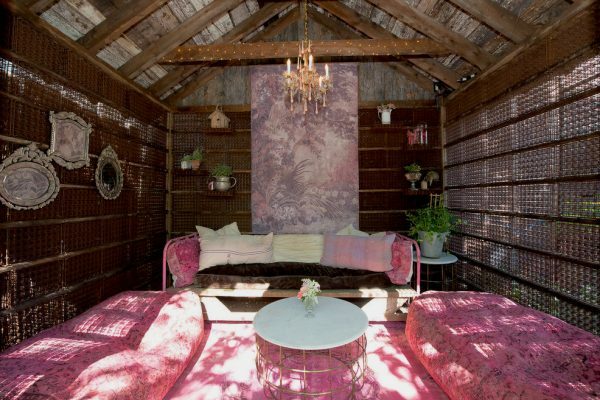 The cottage was moved under the mulberry tree, dotted with pink lights and restyled for cozy comfort. 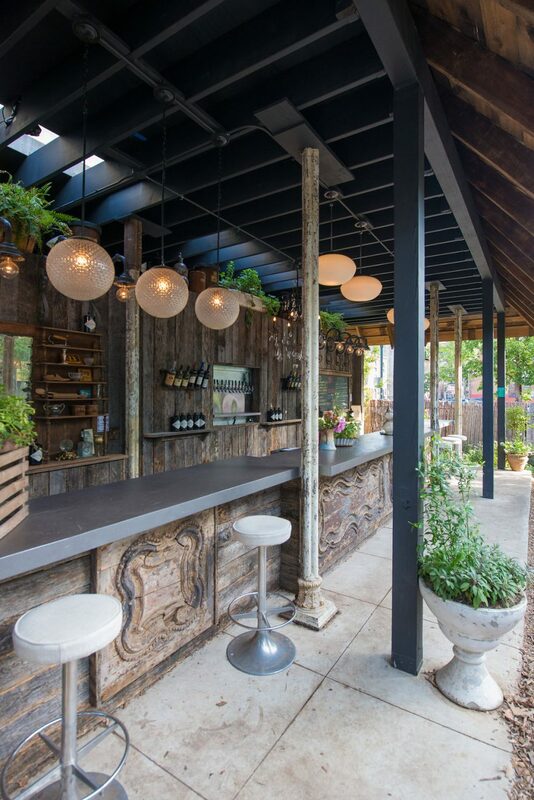 The main pavilion stands true and proud in the middle of the garden with newly added counter and stools; prime spot for people watching. 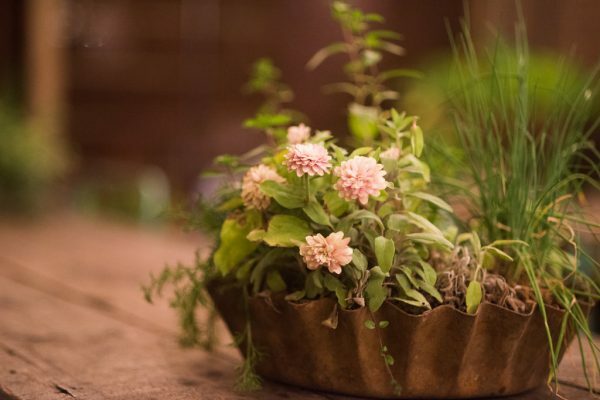 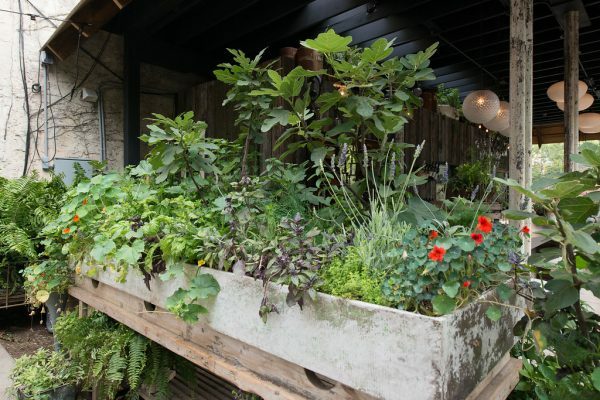 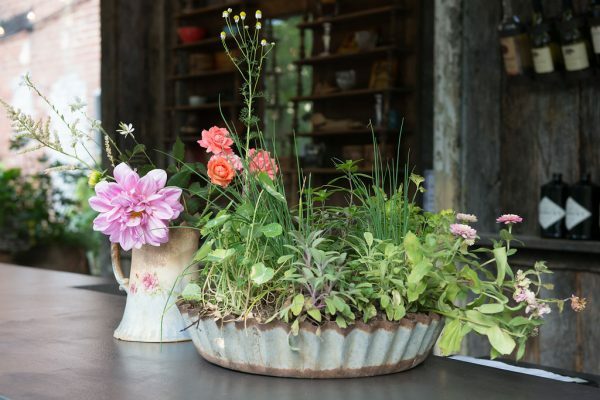 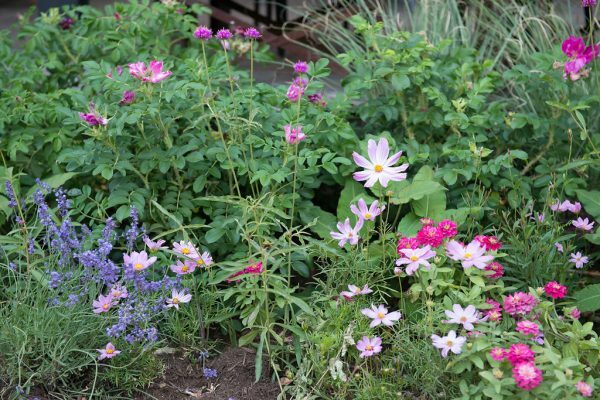 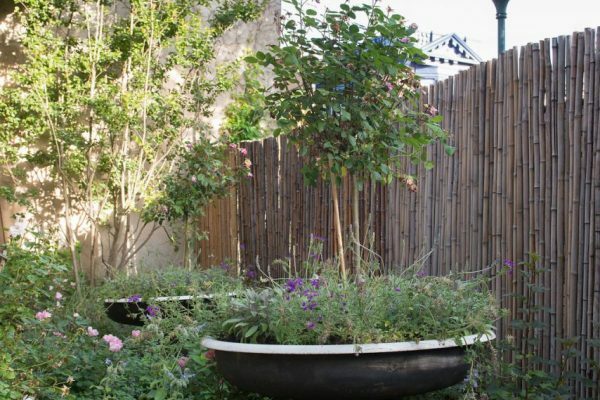 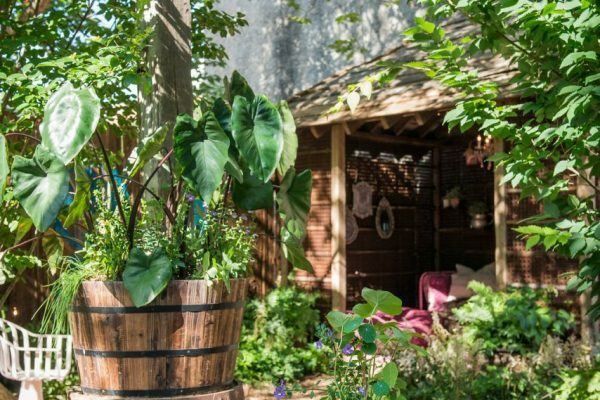 The garden beds and planters are filled with a soothing palette of every shade of green, pink, cream, white and lavender. 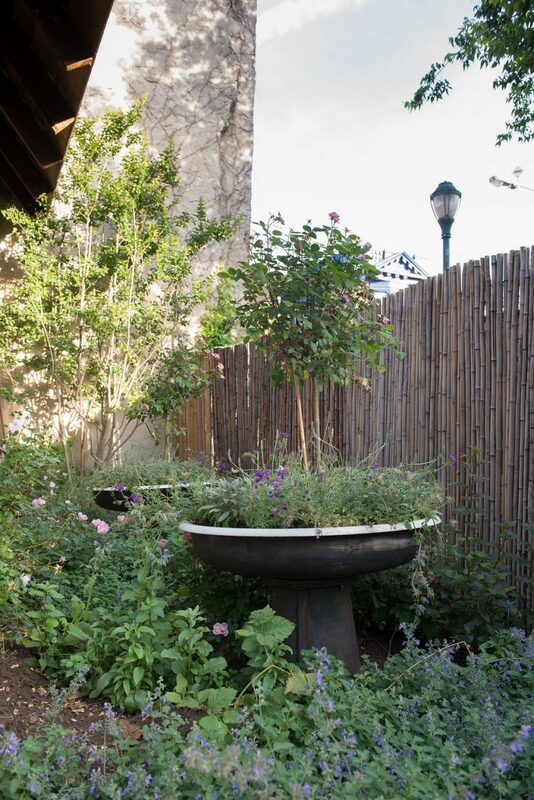 There are a wide range of herbs incorporated in the plantings. 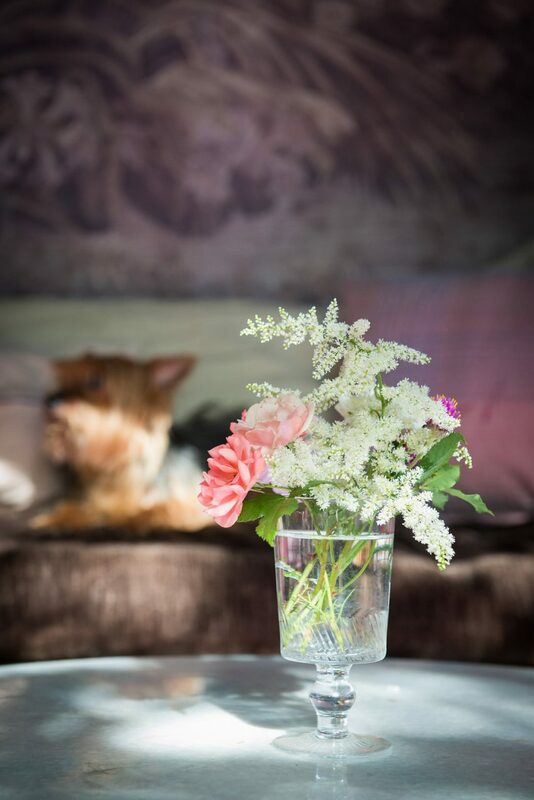 They are gorgeous, edible and intoxicatingly fragrant! 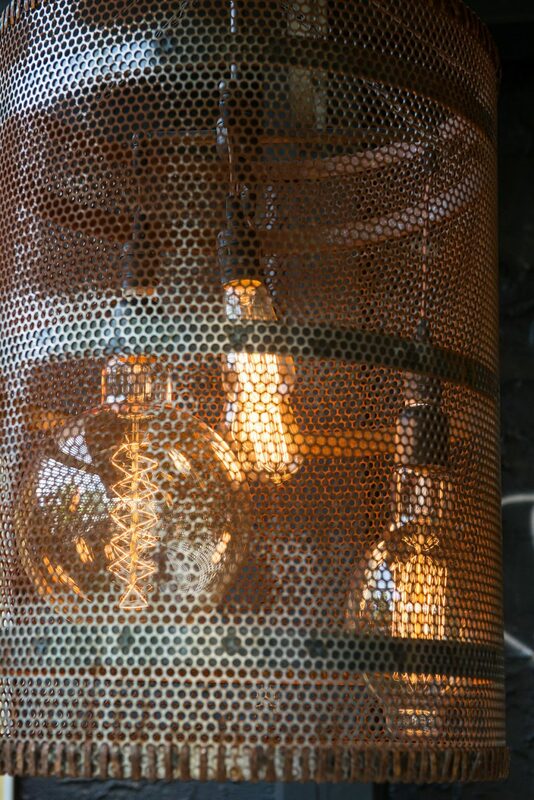 Once again, Jeff Regan, my partner in work, life and everything, was unflappable in executing my vision. 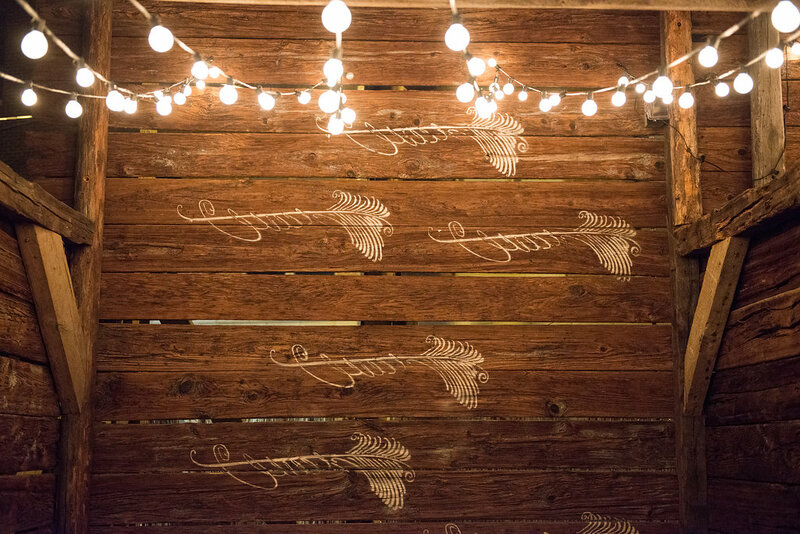 It was an intense time line from ground breaking to grand opening, but somehow, he made it happen. 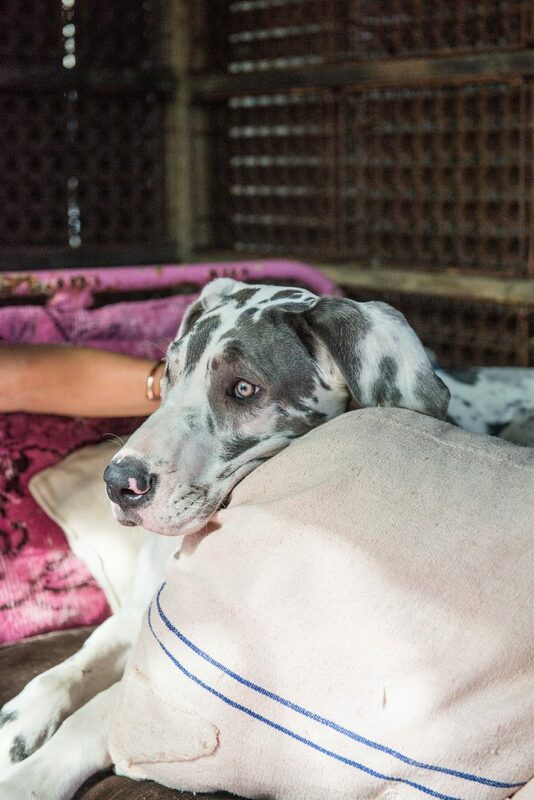 This was a crew that worked tirelessly! 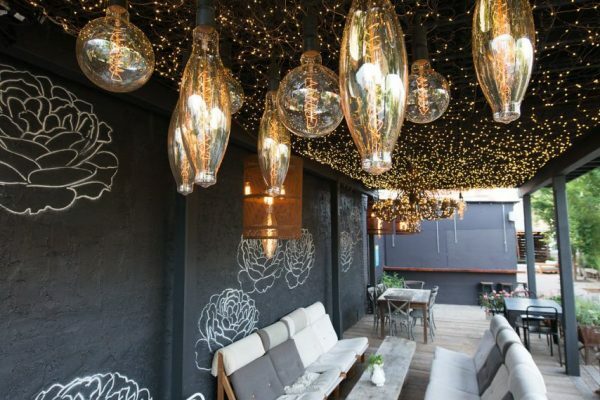 It has been a true pleasure working Suzanne O’brien of Khyber Pass Pub. 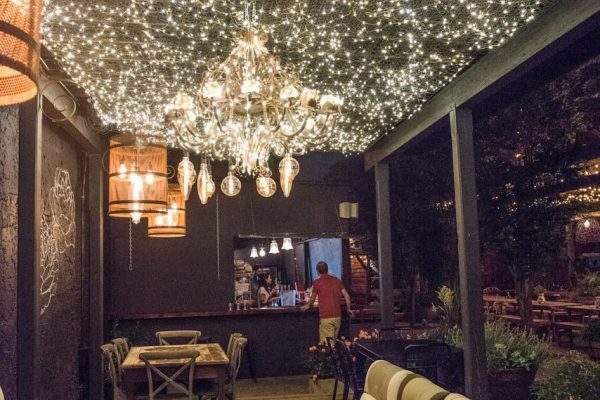 They have awesome cocktails and fantastic food, even some vegan options! 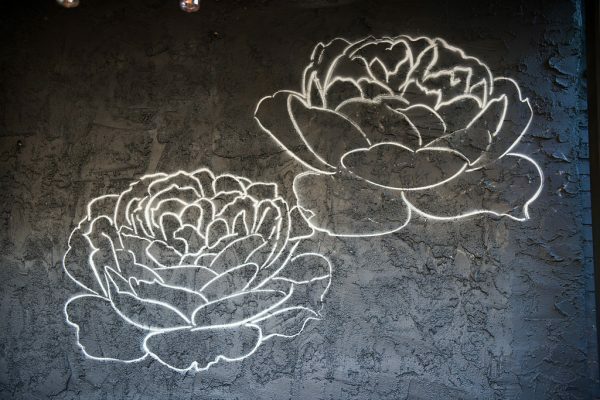 Ashely, Paco, Chris and Alexis are so conscientious and pleasant and I am so happy our paths have crossed. 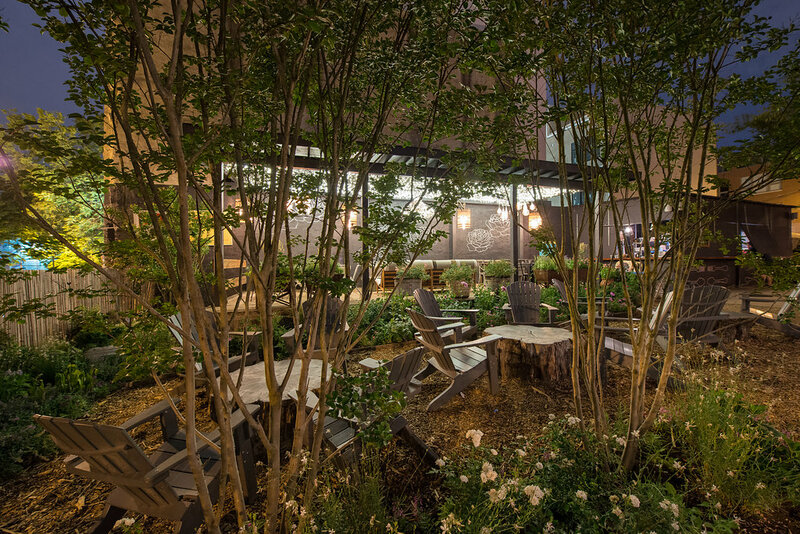 Seth Pearsoll of PHS worked side by side with me and Jeff bringing this vision to life. 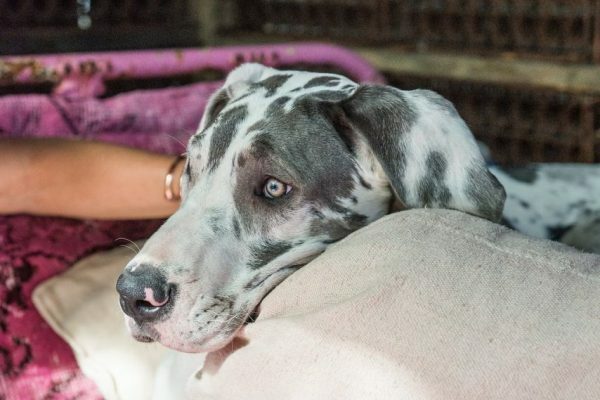 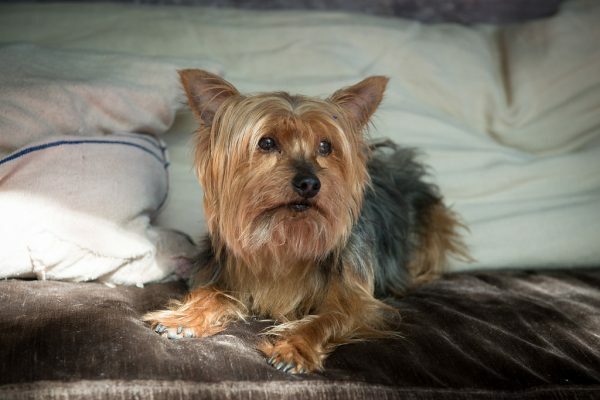 He is a gem in every way and we could not have gotten this done without him. 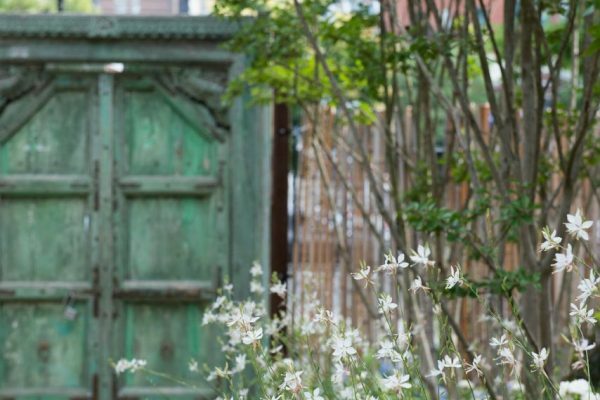 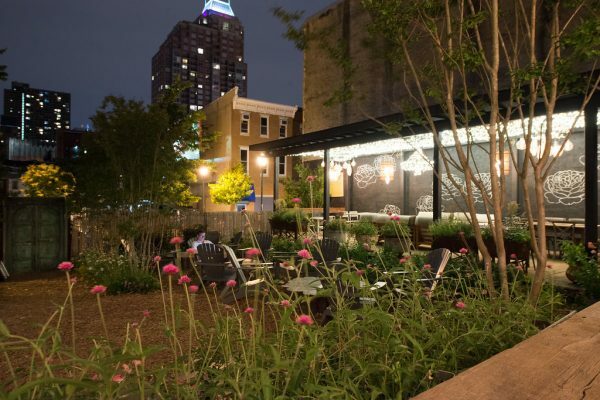 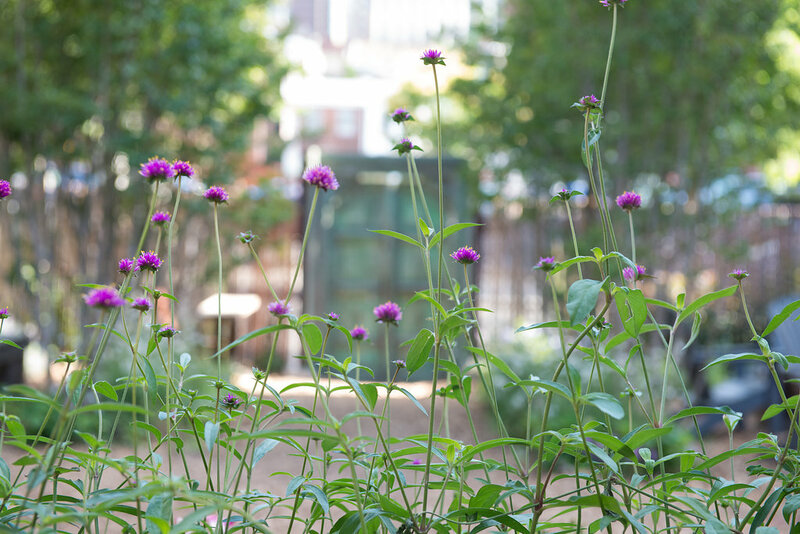 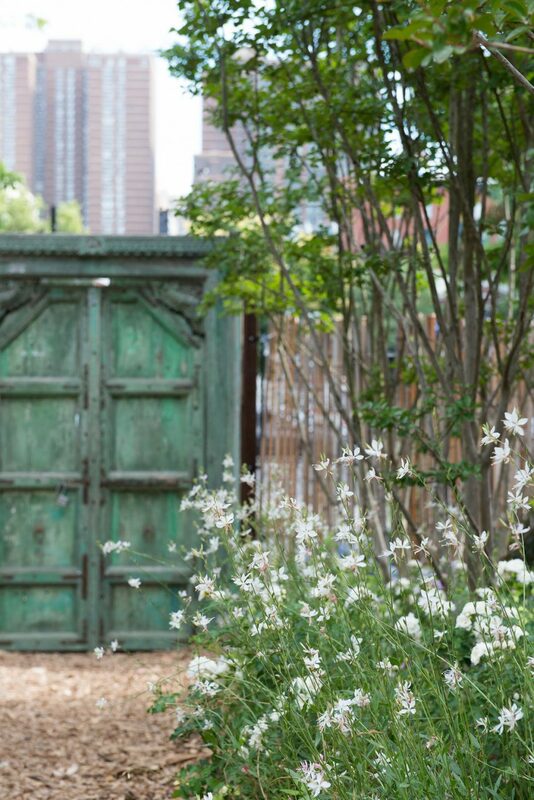 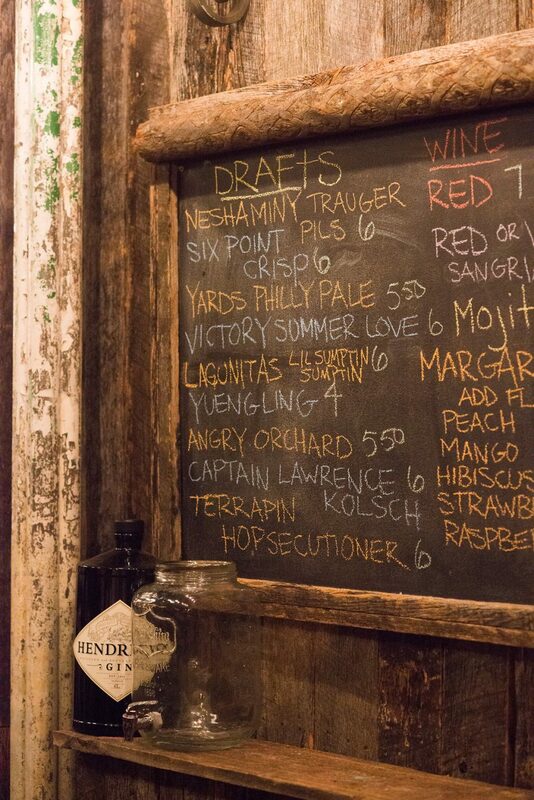 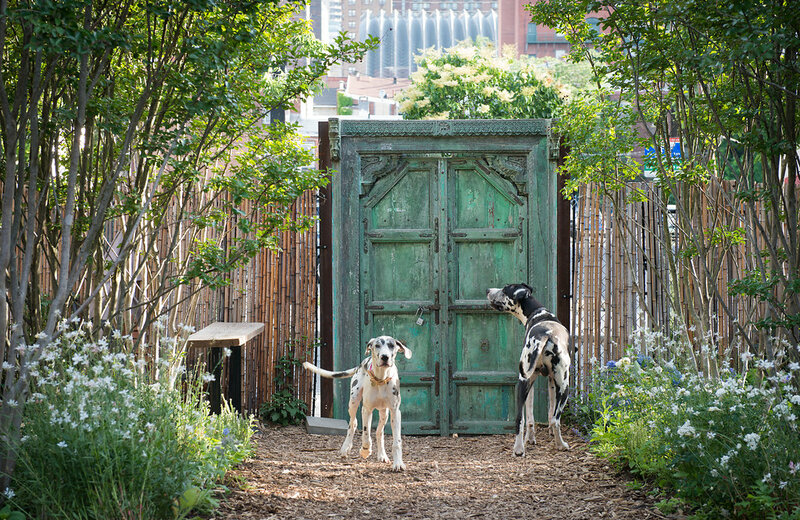 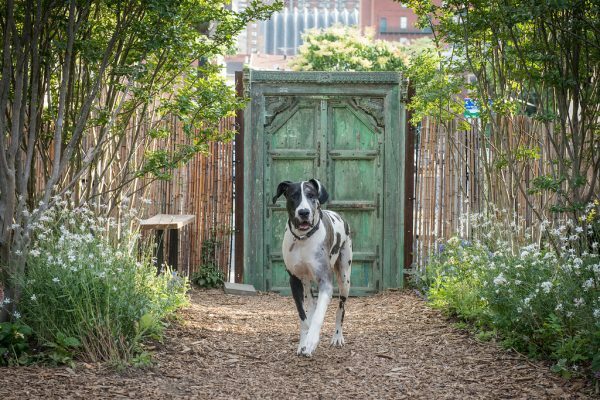 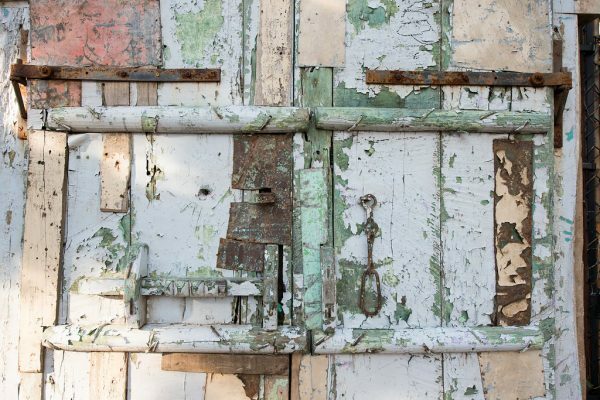 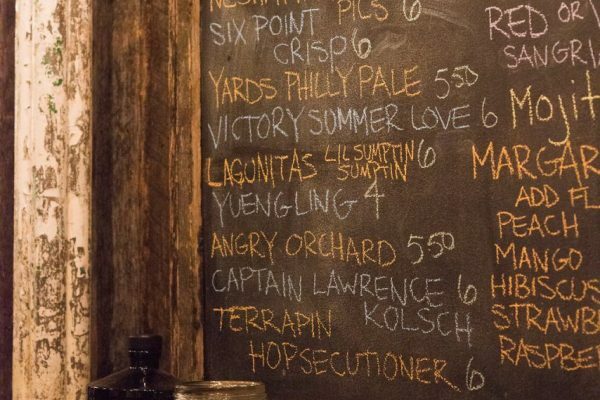 Pass through the old green doors, bring your dogs and your friends, sip a pink champagne, or an ice cold beer, lounge and relax, all while simultaneously helping PHS continue outstanding work that they do to make Philadelphia so special. 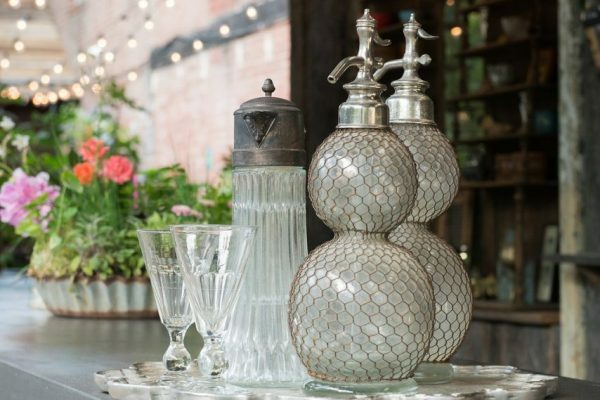 Many thanks to Hendricks Gin for their generous support of the garden and to Whole Foods Market for their sponsorship. 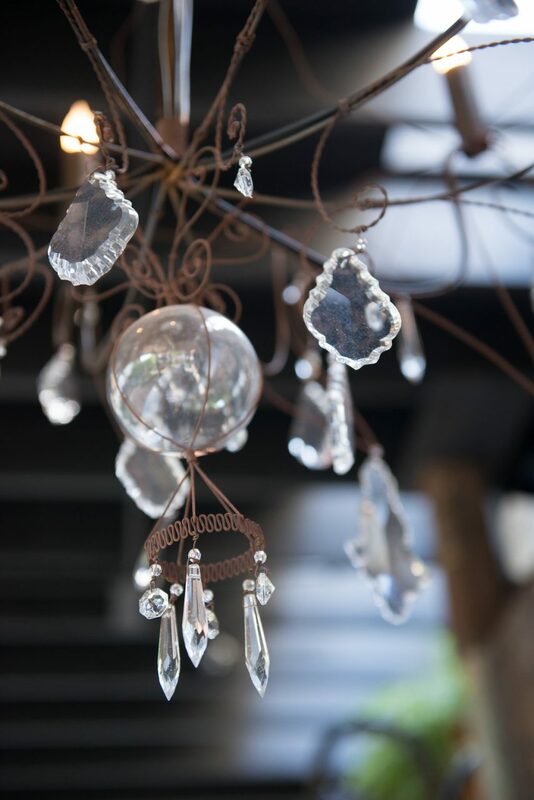 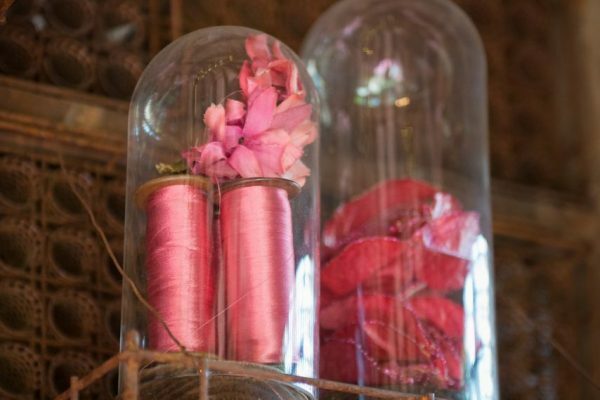 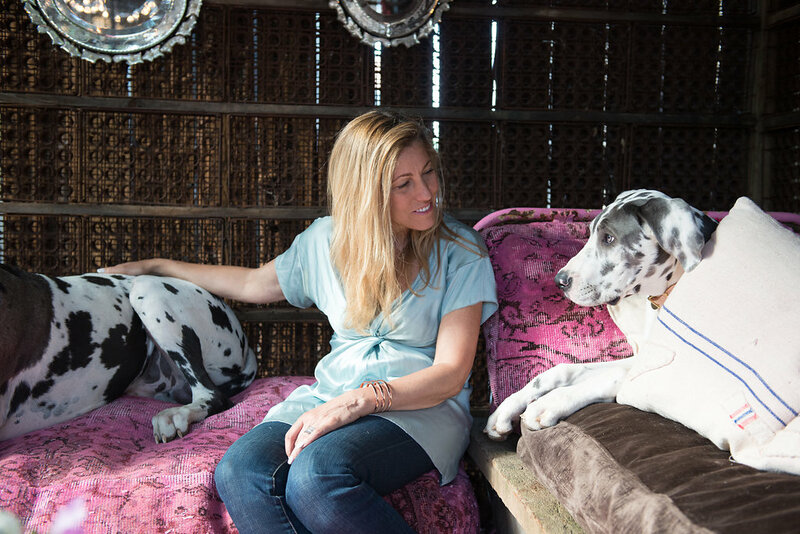 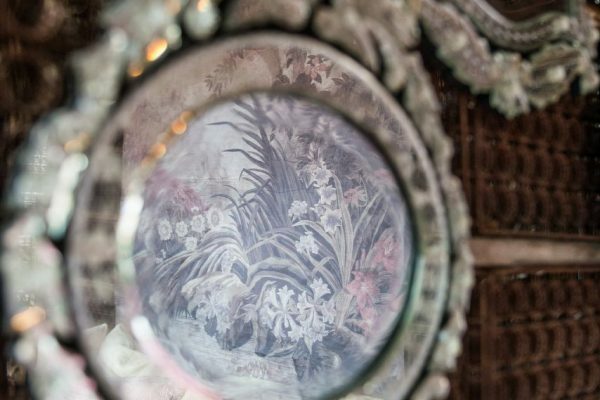 Julia Lehman Photography is responsible for capturing the magic through her lens. 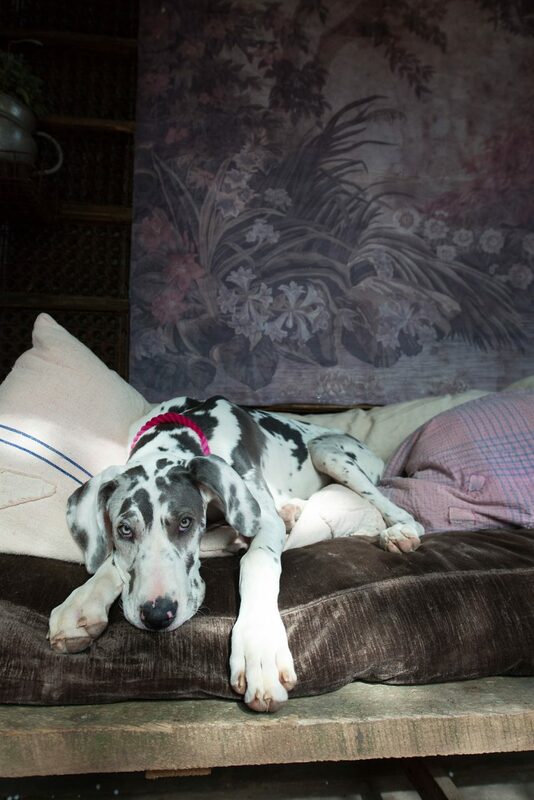 It was a really long day for us styling and shooting! 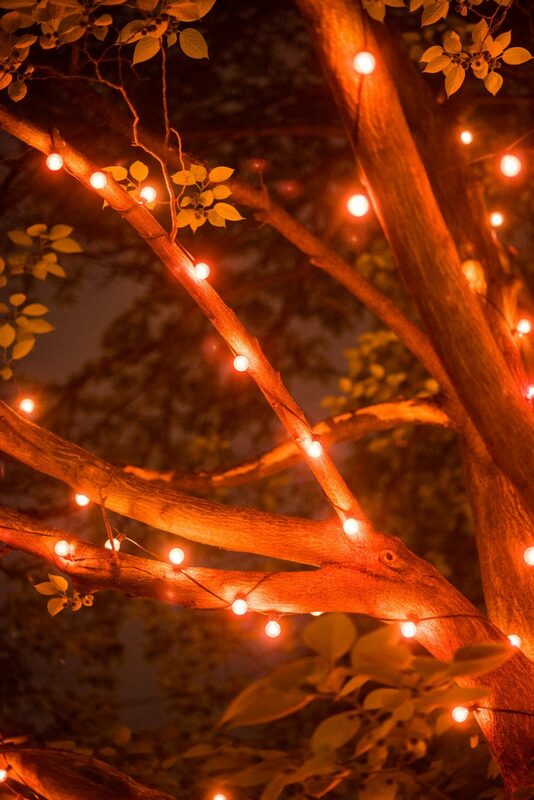 As always, I just love you! 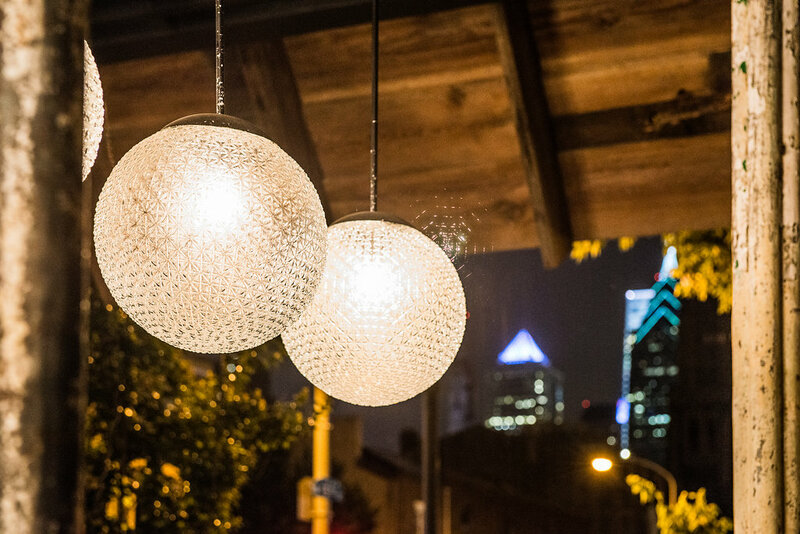 I hope to see you on South Street!